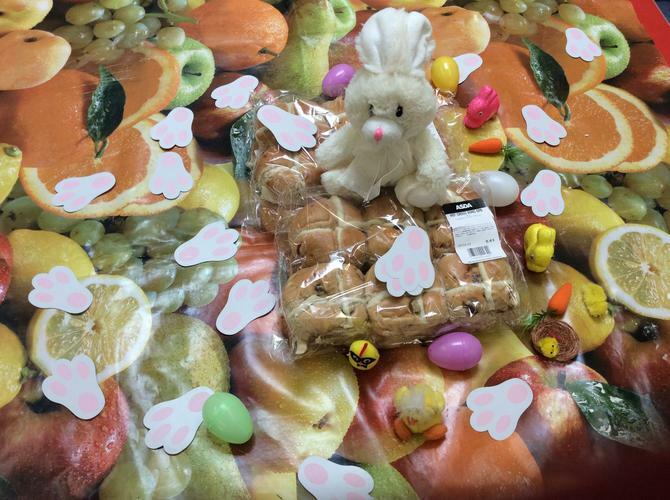 We had a lot of fun getting ready for Easter. 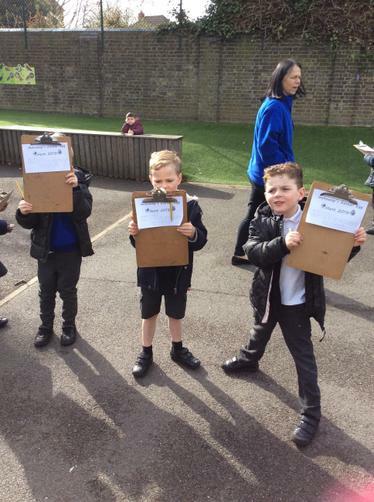 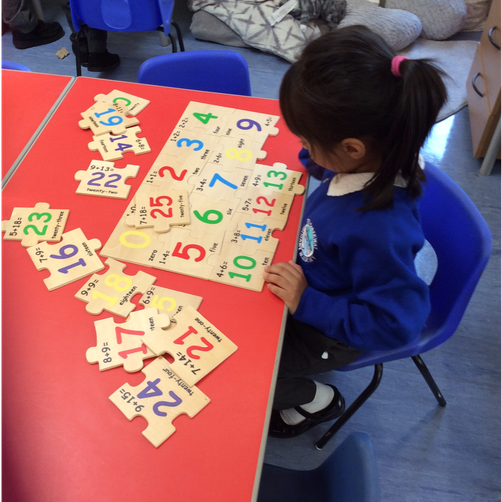 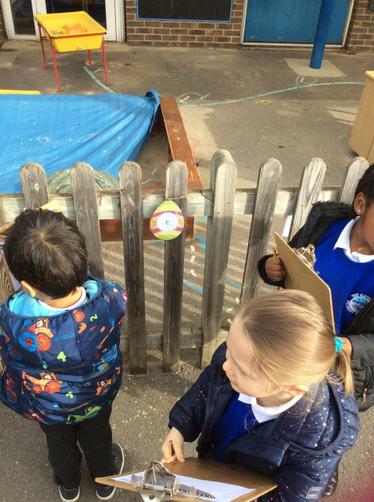 As well as making Easter cards for our families, we made Easter nests and had an Easter egg hunt with clues we had to find that we put together to spell out a secret message! 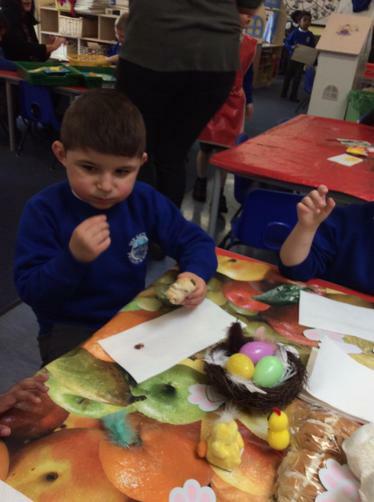 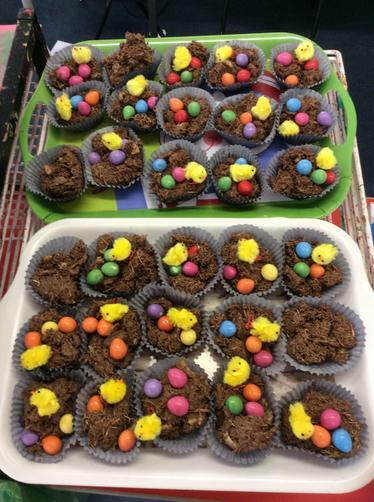 The Easter bunny also popped by to deliver some hot cross buns which we all tasted and agreed they were yummy. 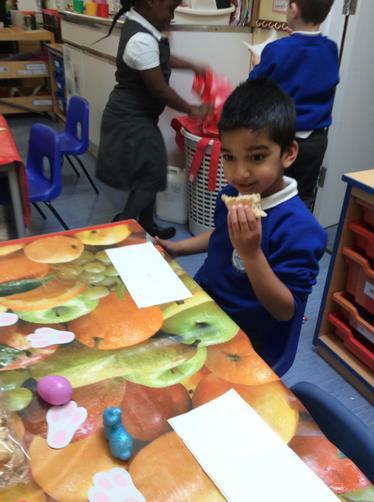 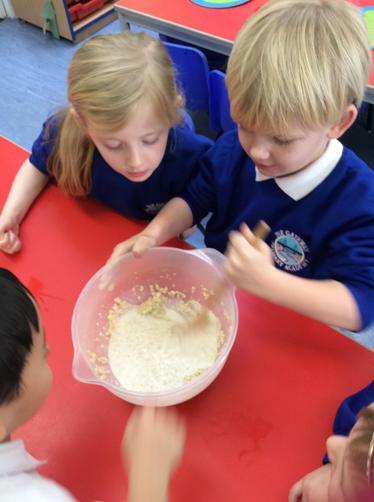 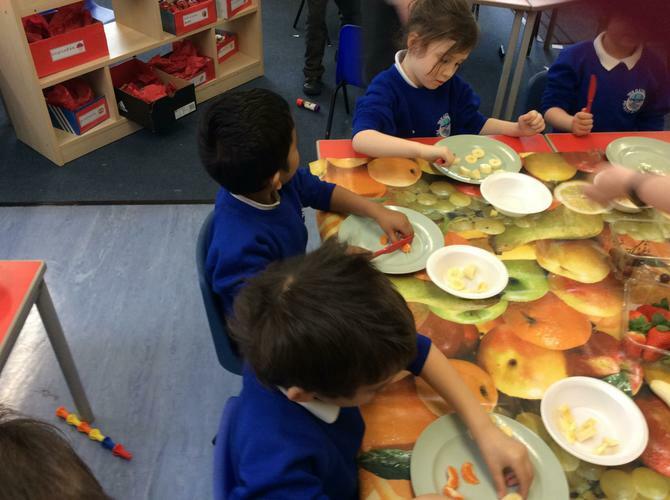 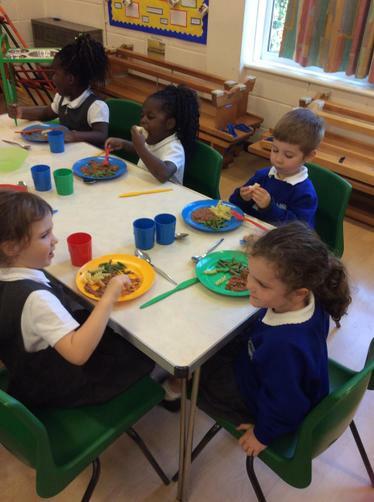 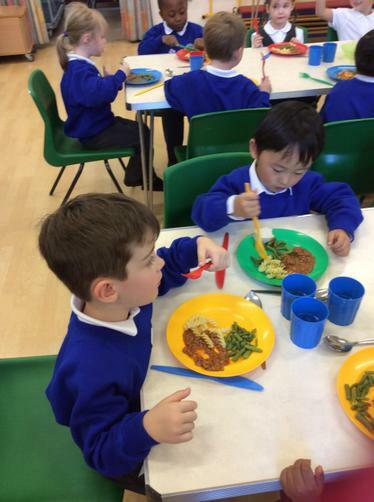 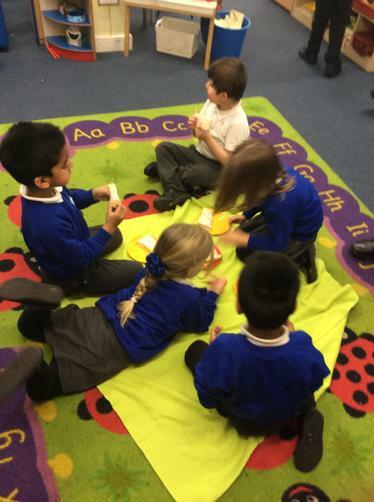 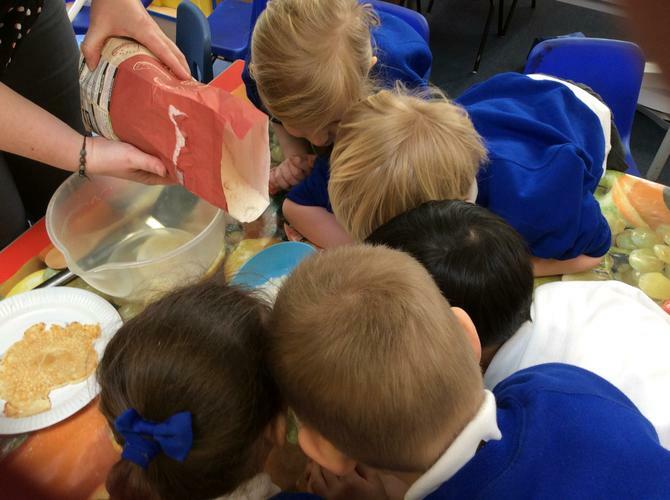 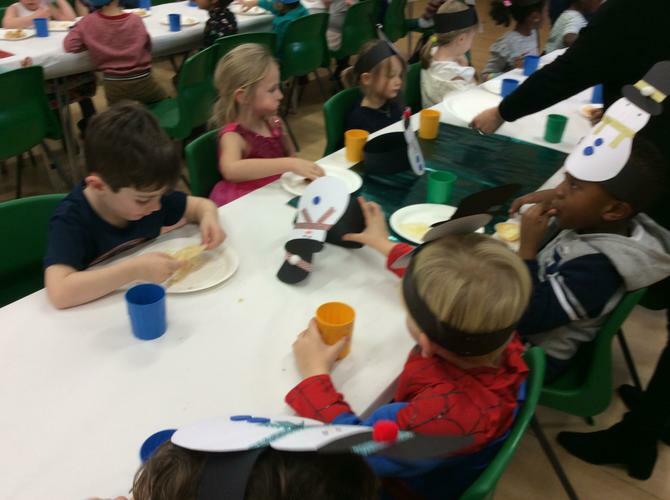 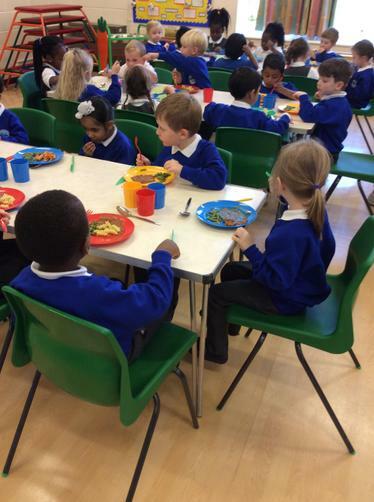 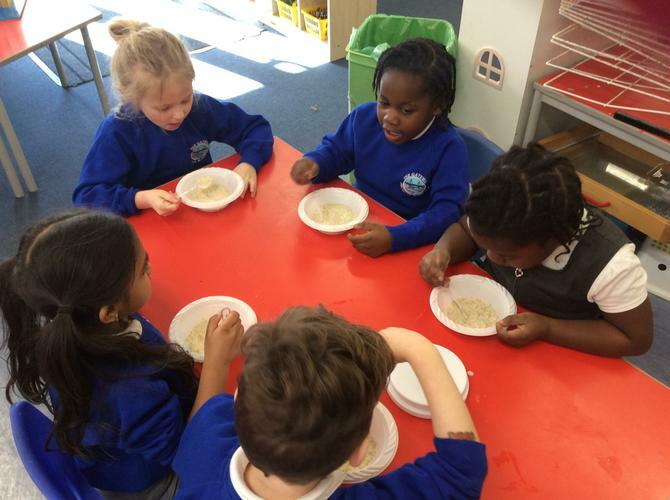 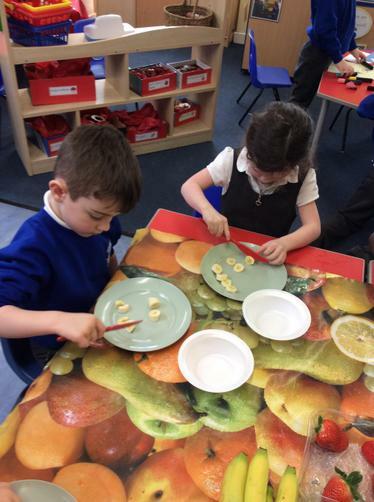 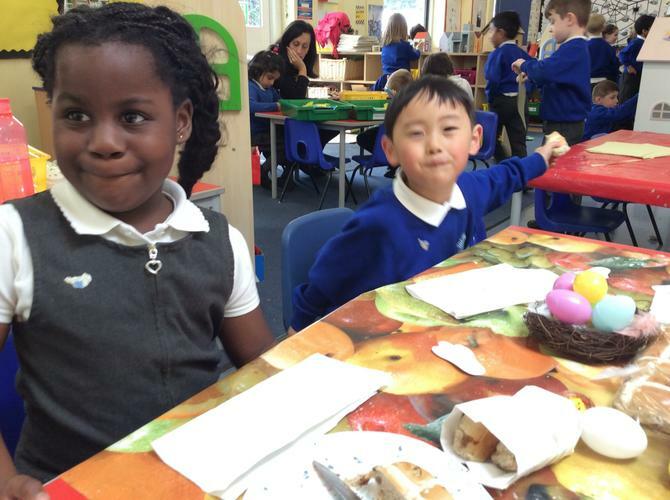 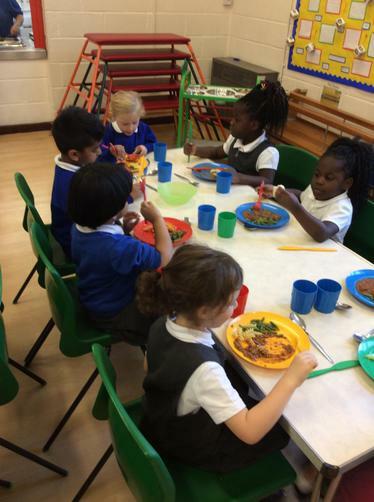 Our topic this term has been ‘Food and Celebrations’. 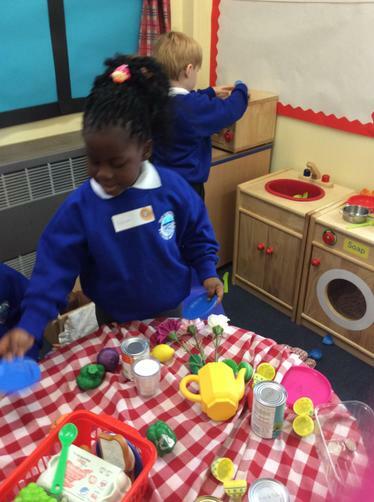 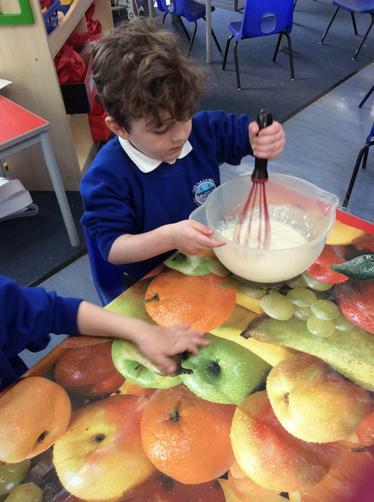 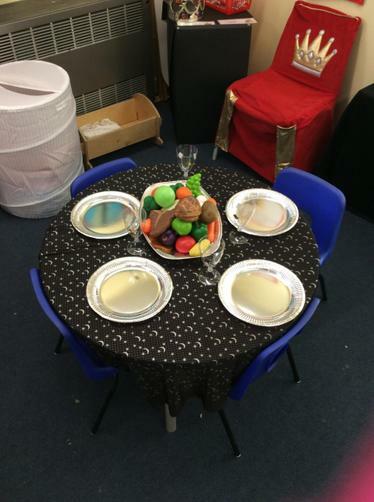 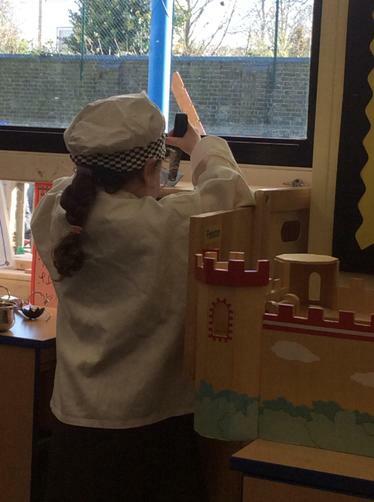 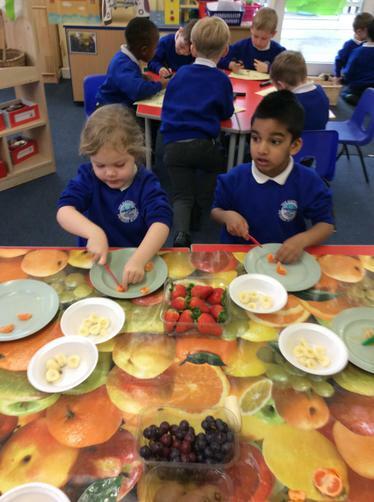 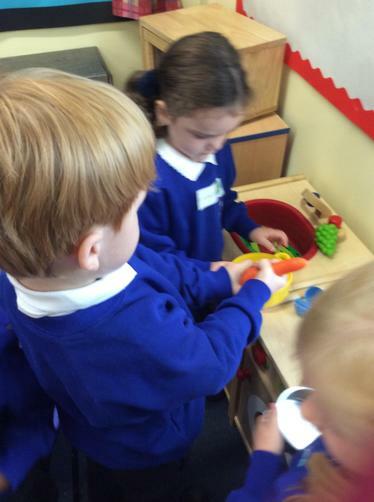 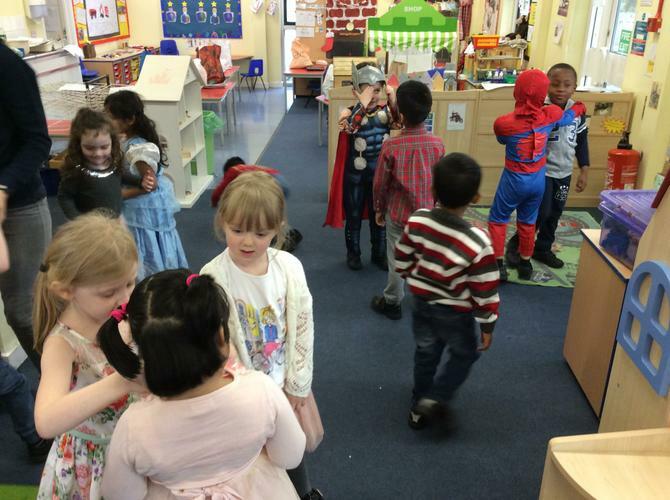 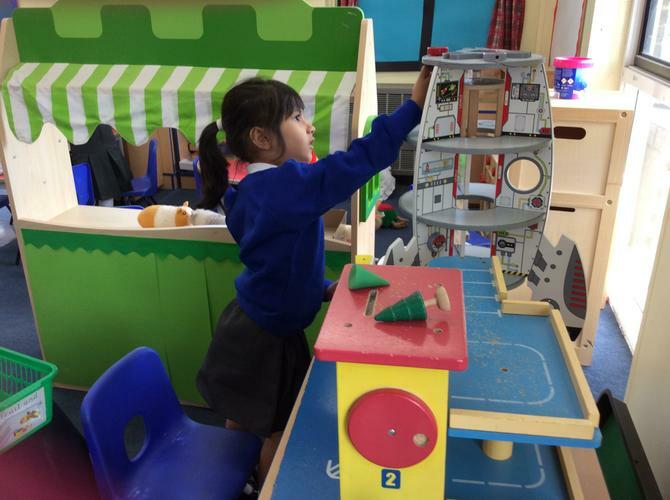 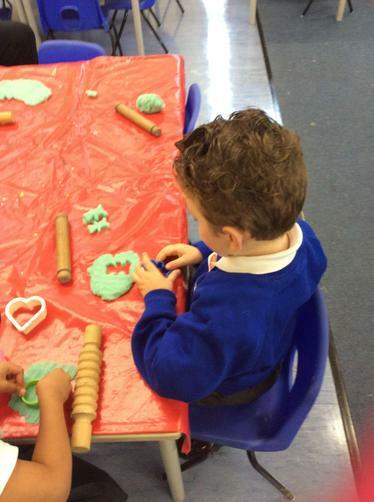 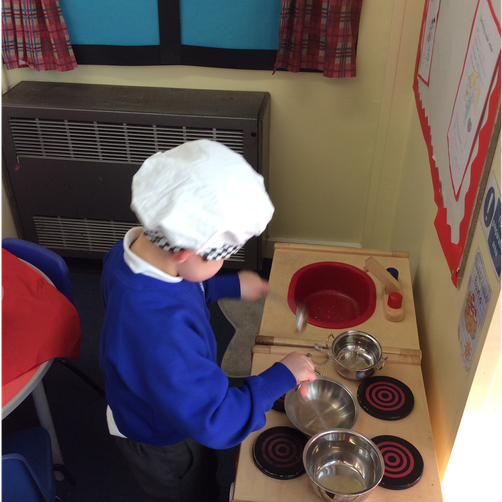 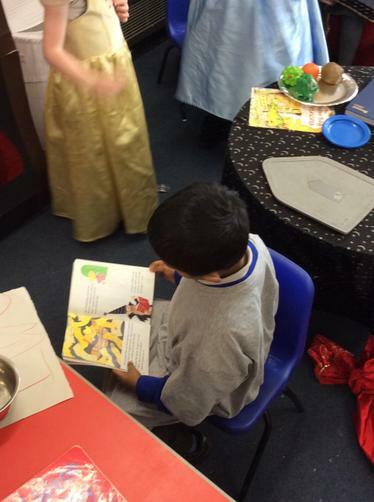 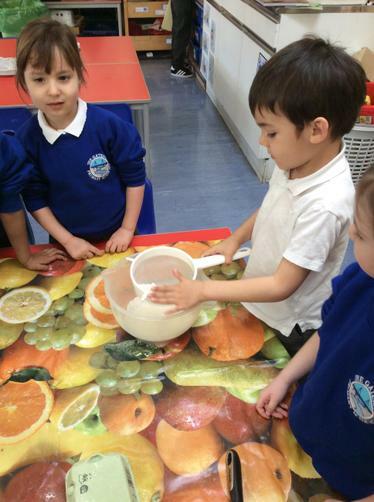 The children have really enjoyed playing in our bakery role play area as well as doing some real cooking. 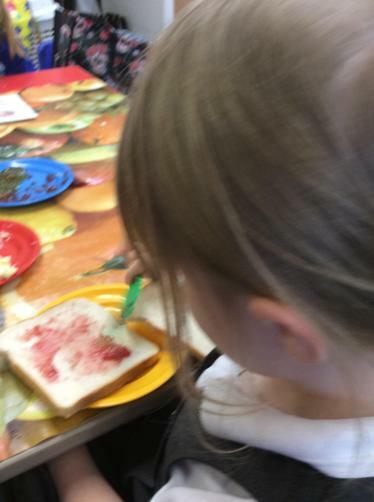 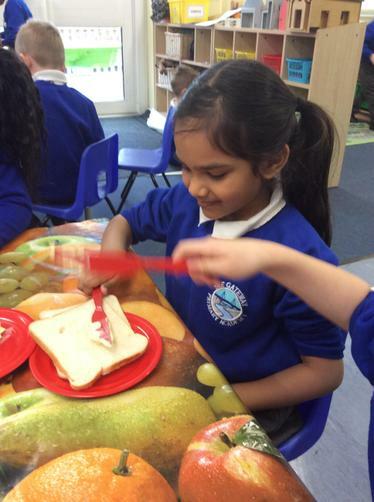 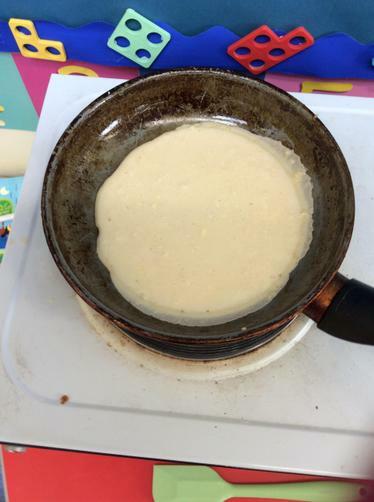 We have made pancakes, fruit salads and sandwiches - all of which were very tasty! 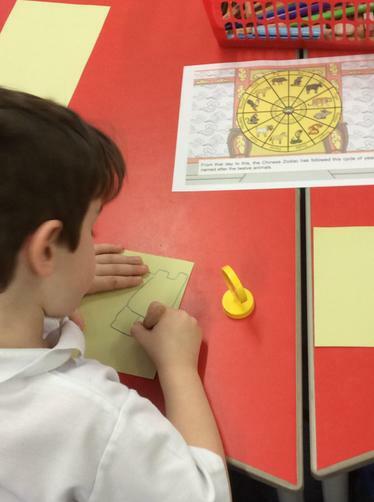 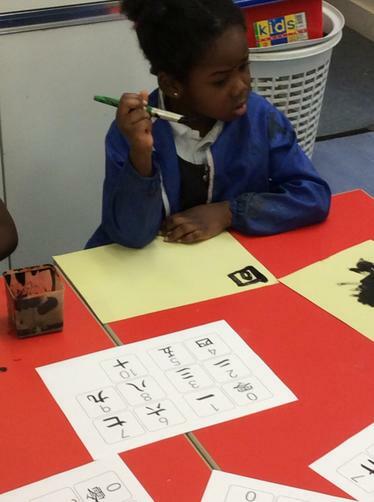 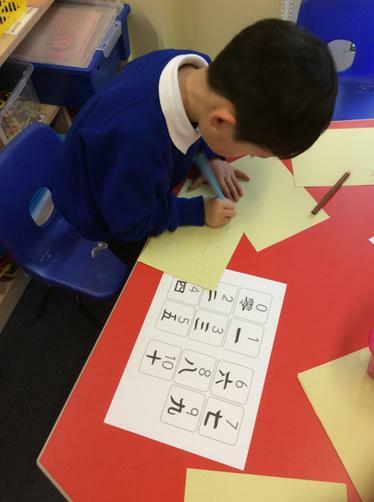 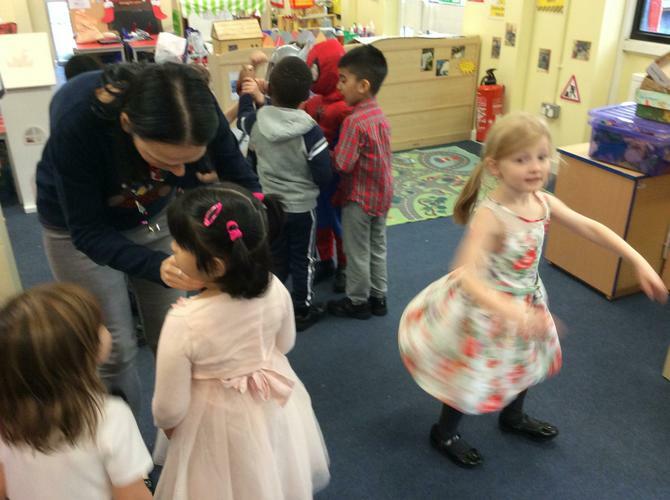 Swans really enjoyed learning about Chinese New Year. 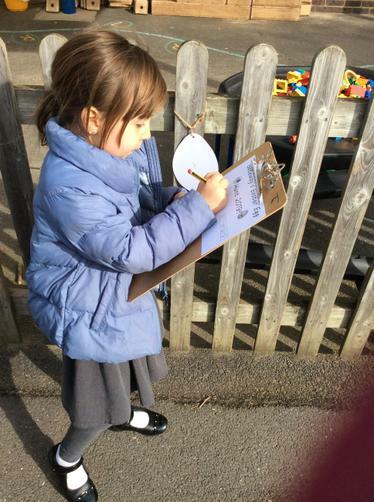 They listened to the story of the animal race and worked out which year they were born in. 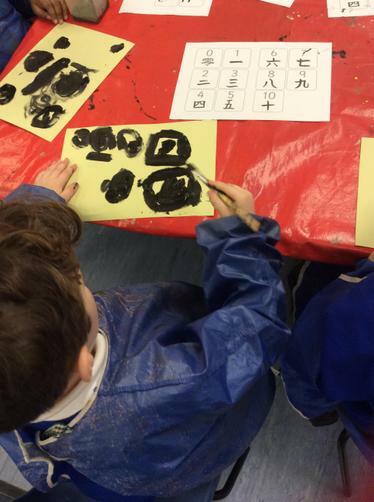 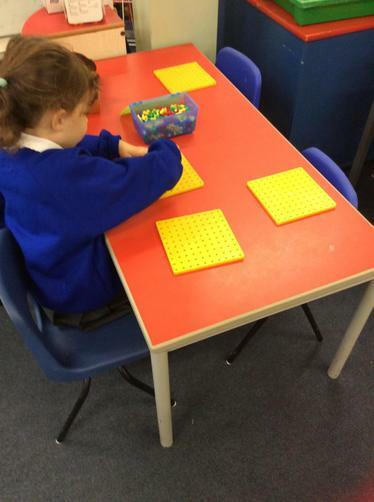 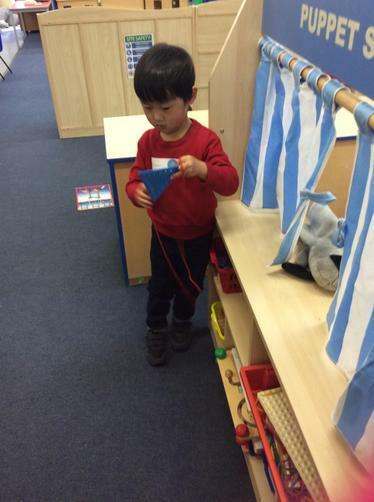 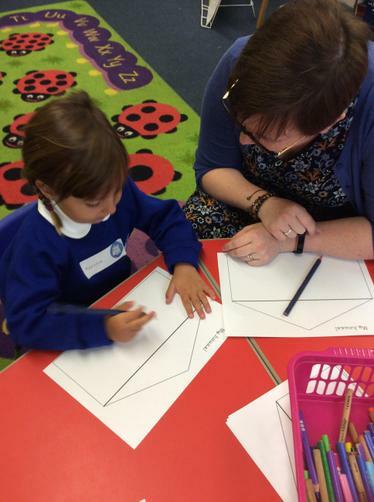 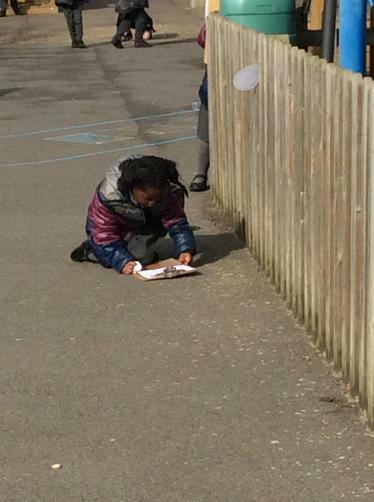 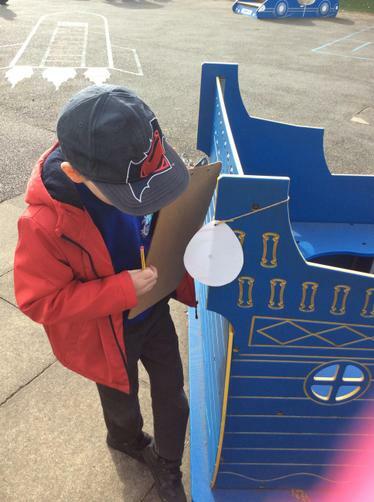 They could try writing numbers, drawing pictures from the Chinese lunar calendar, or making their own lanterns. 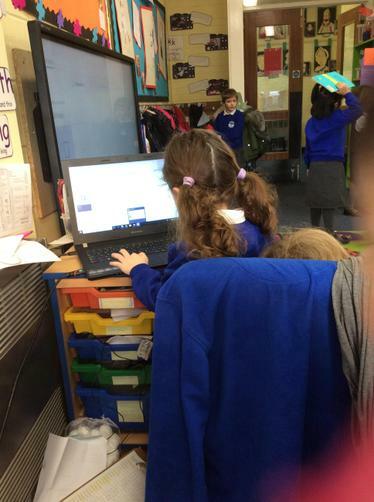 They also used the laptop to look at a video of a dragon dance. 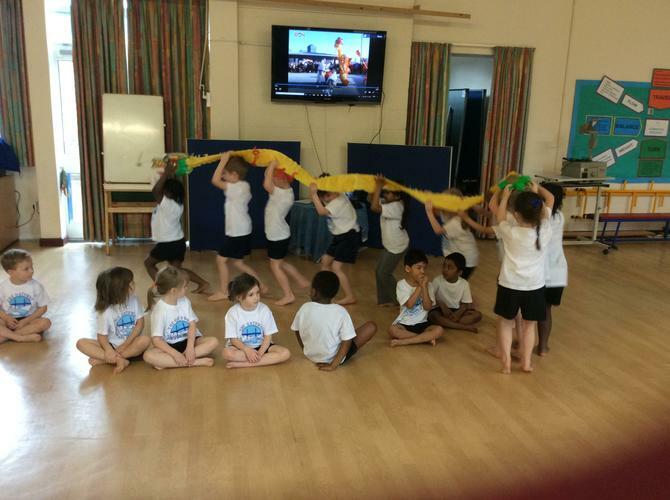 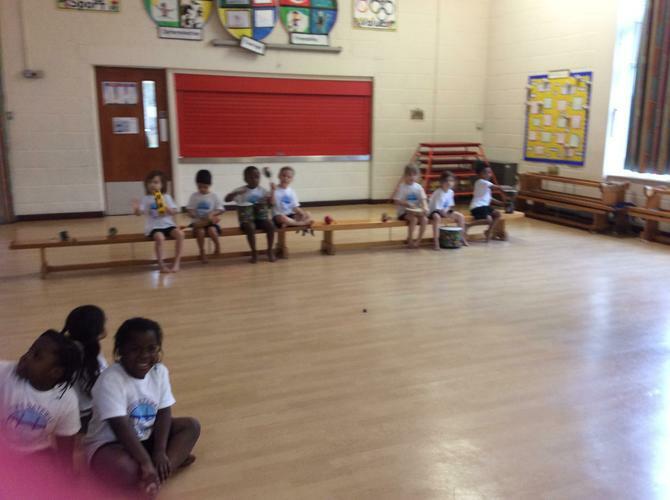 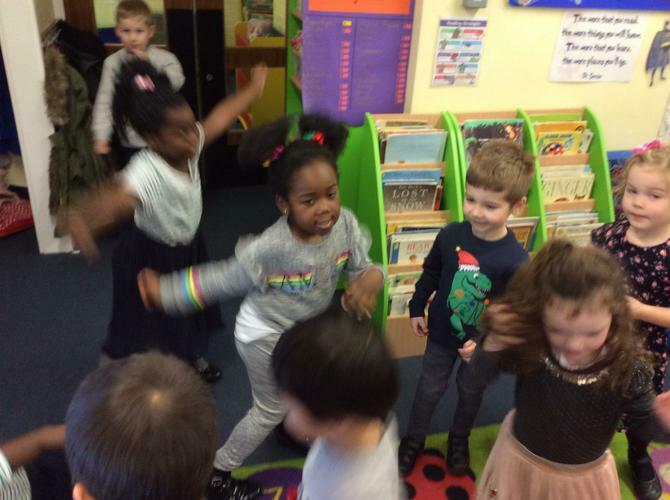 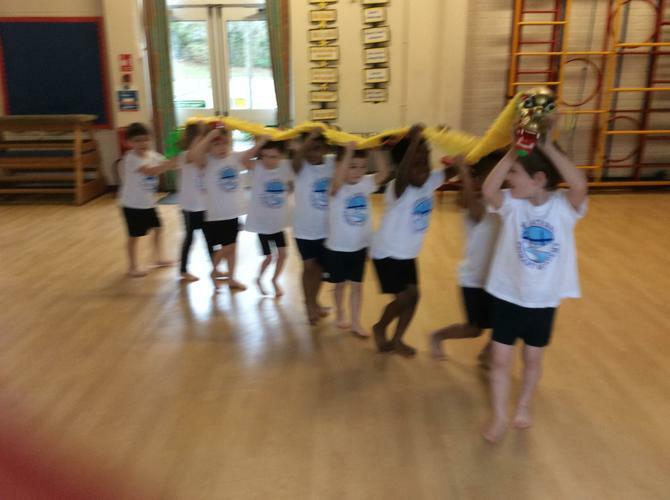 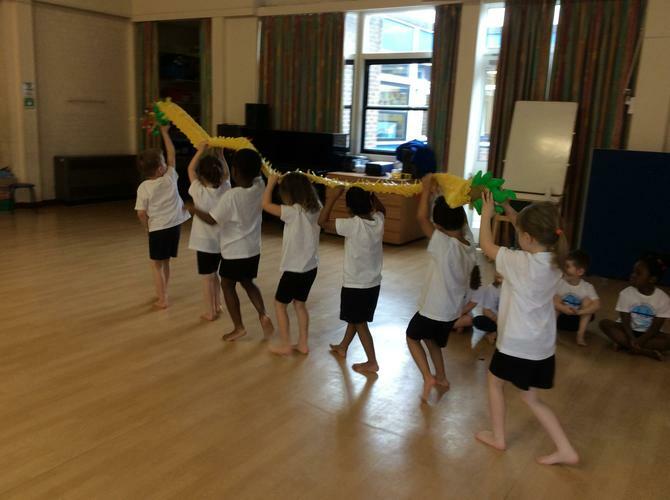 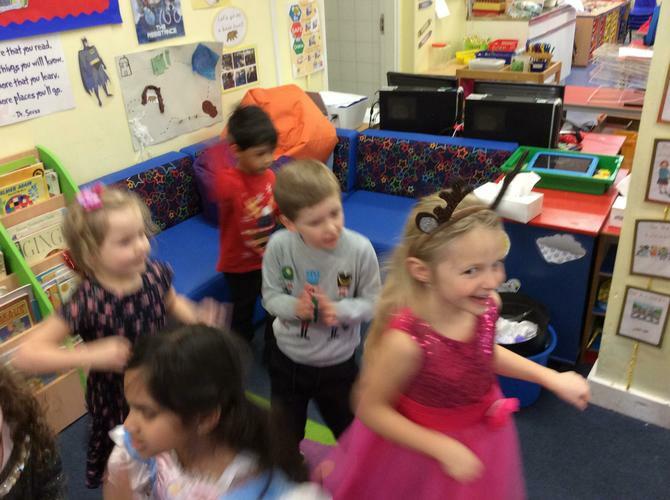 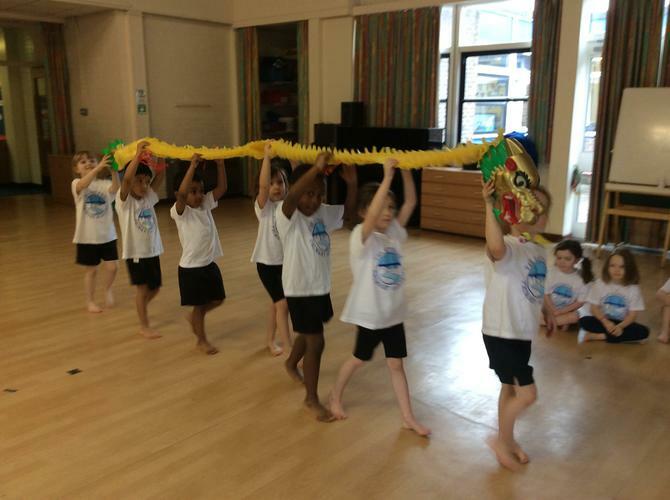 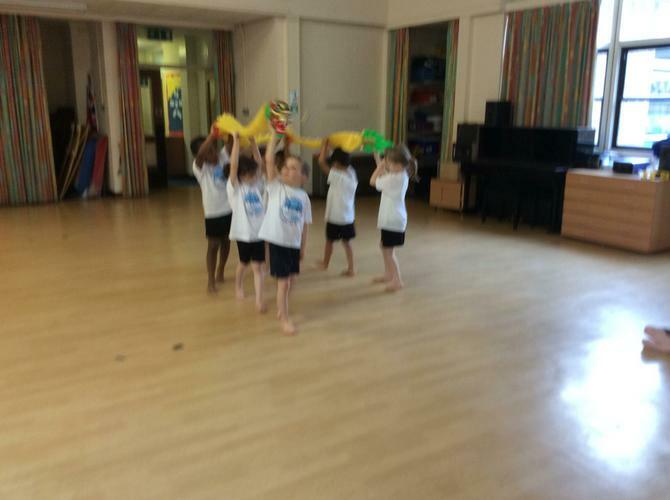 In PE they learnt how to do our own dragon dance which was great fun! 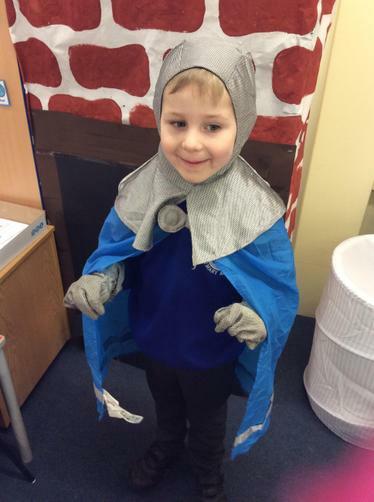 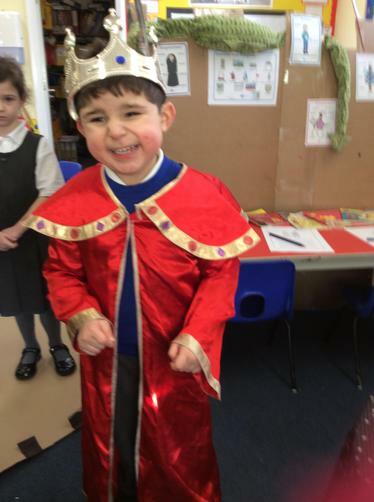 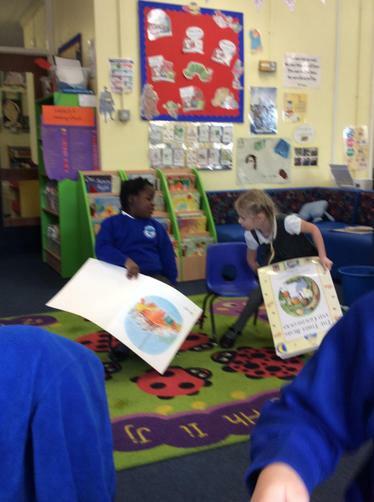 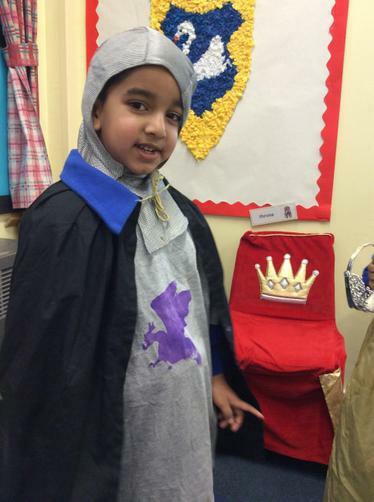 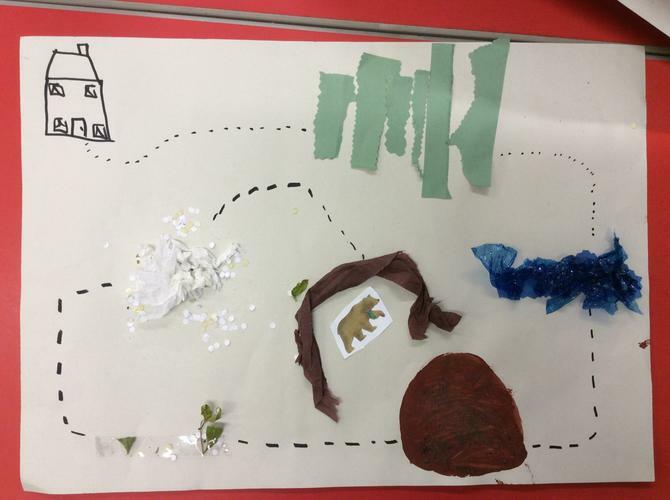 We have had a lot of fun learning about tradititinal tales this half term! 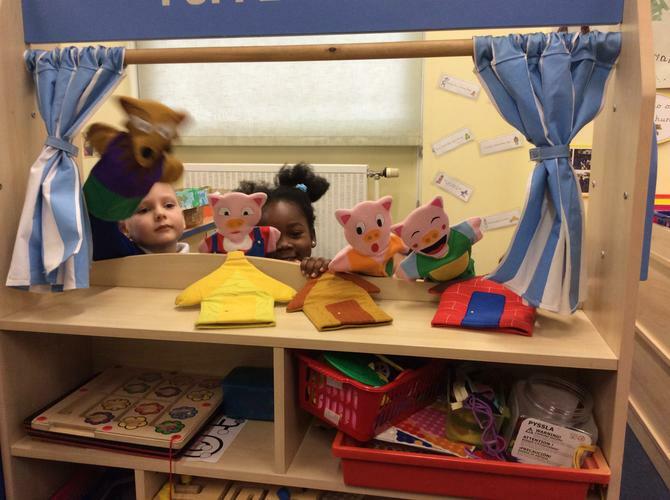 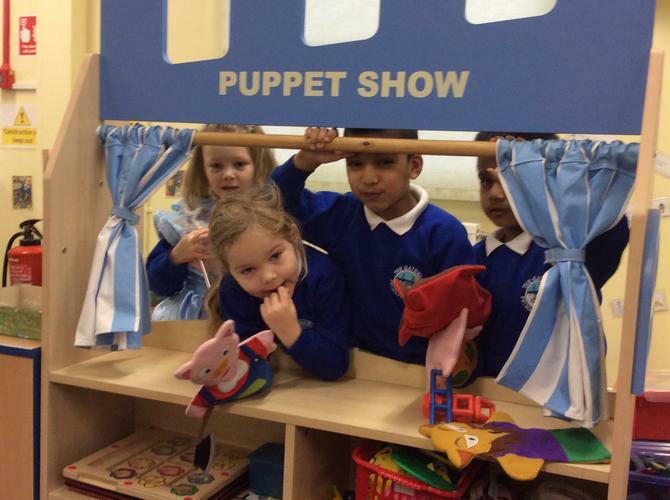 The children especially enjoyed playing in our castle and acting out stories in the puppet theatre. 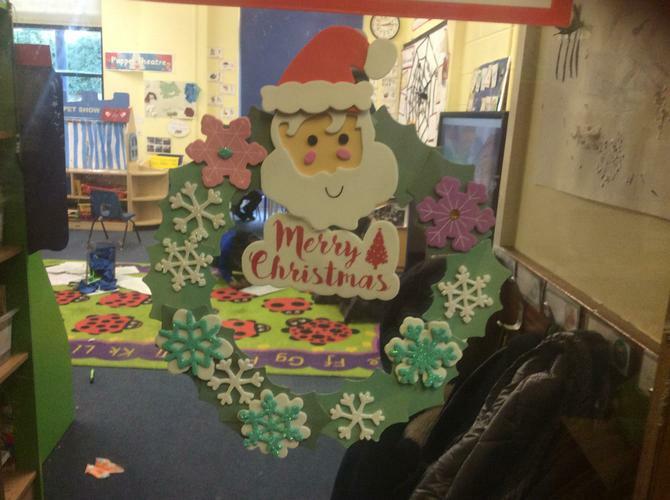 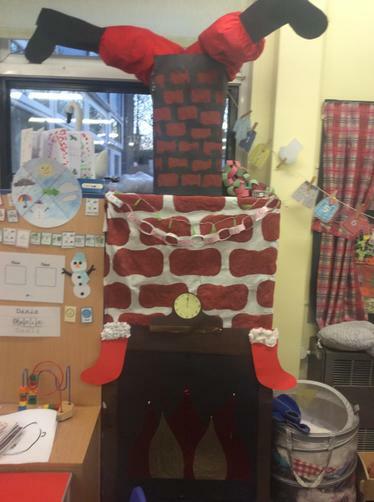 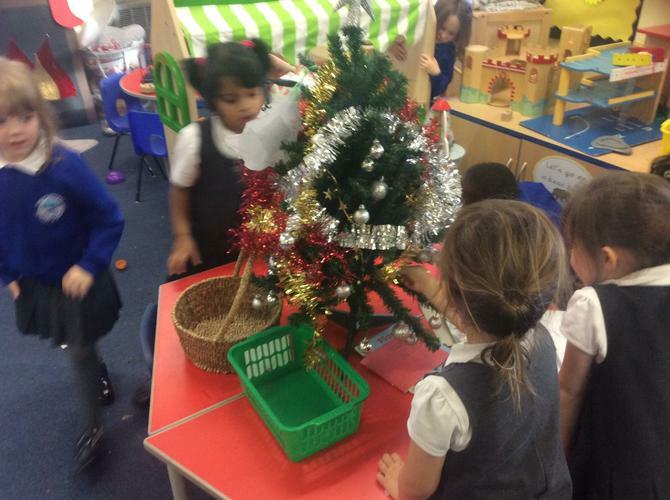 We have been very busy getting in the Christmas spirit in Swans! 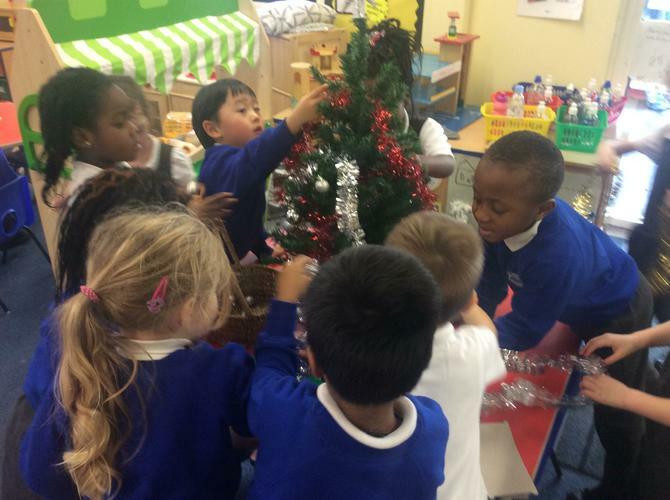 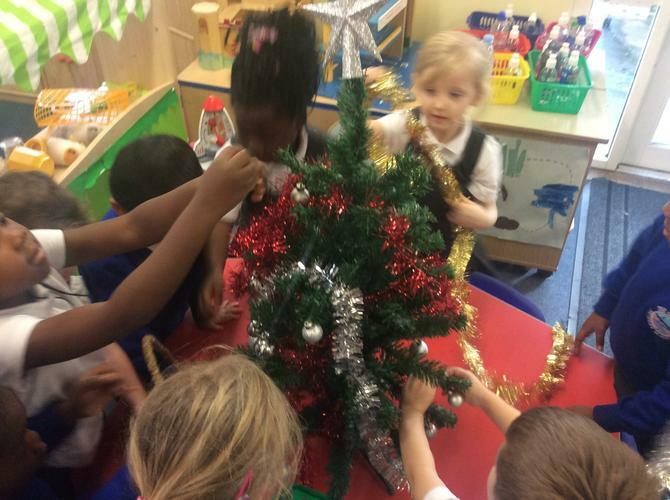 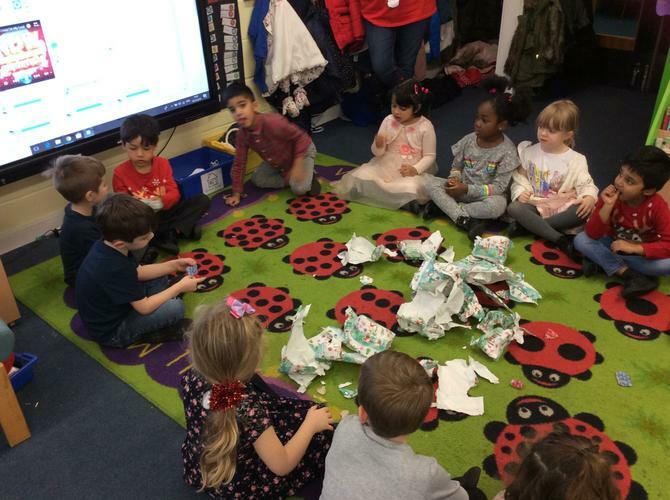 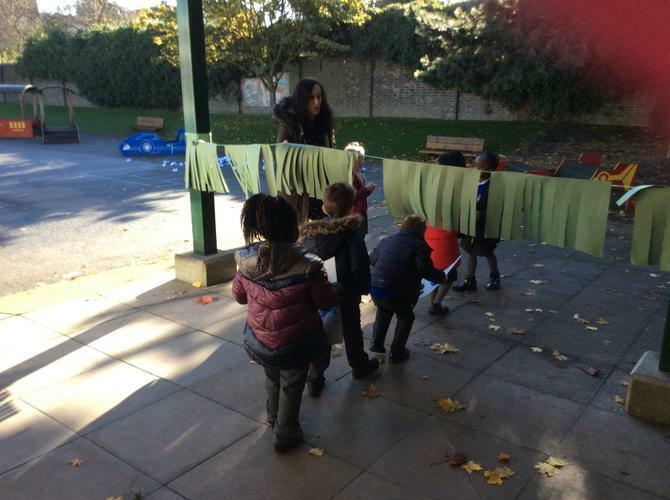 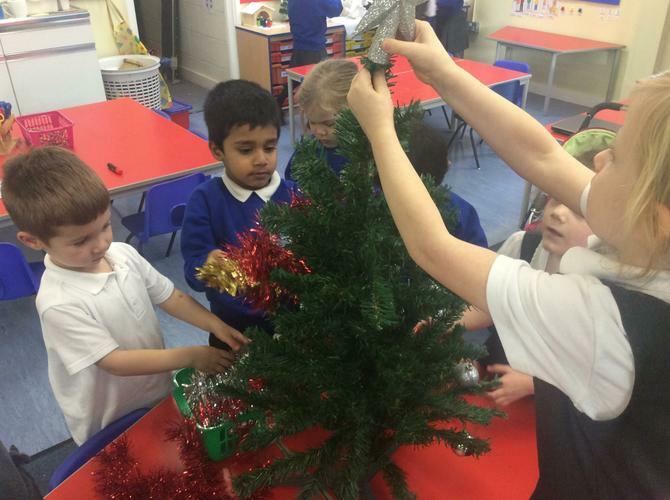 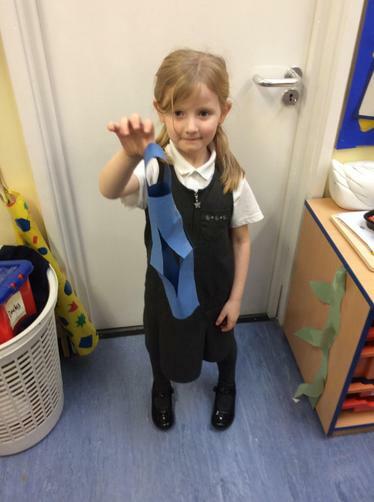 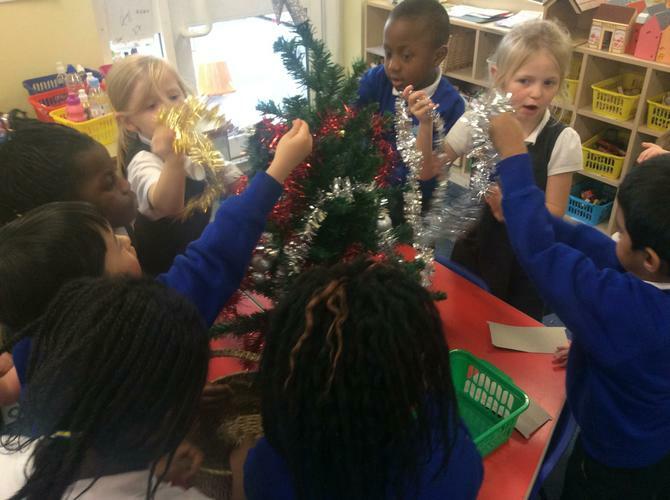 The children decorated the tree, made paper chains, and wrote letters to Father Christmas. 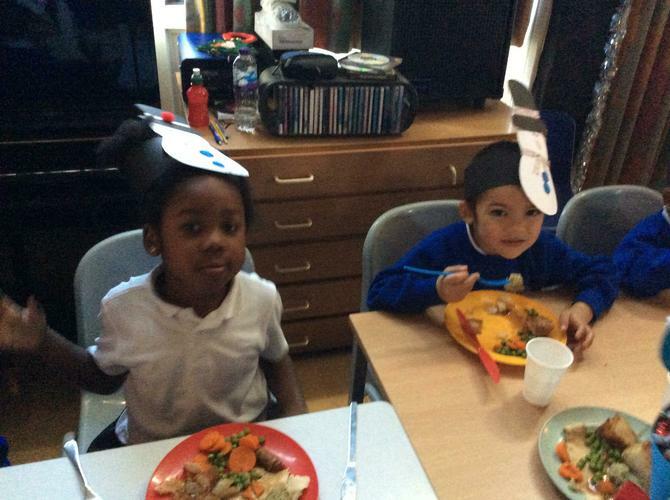 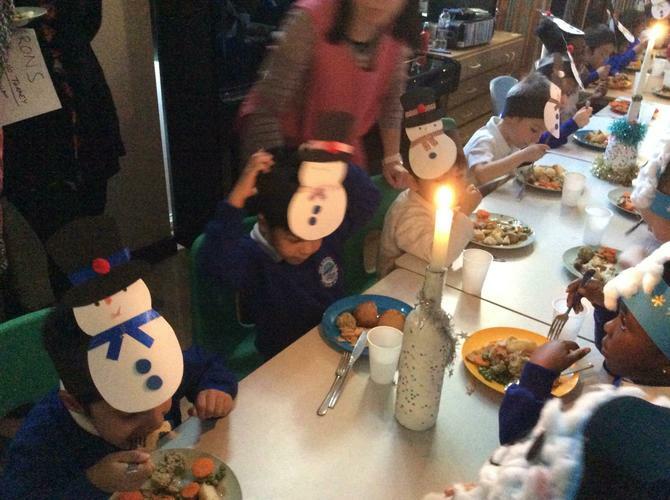 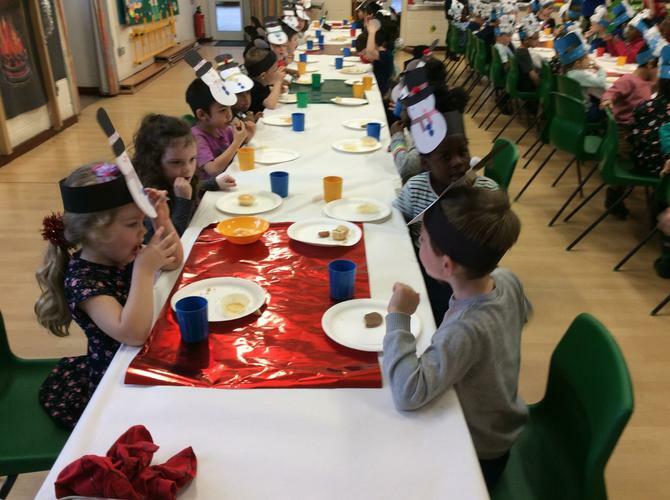 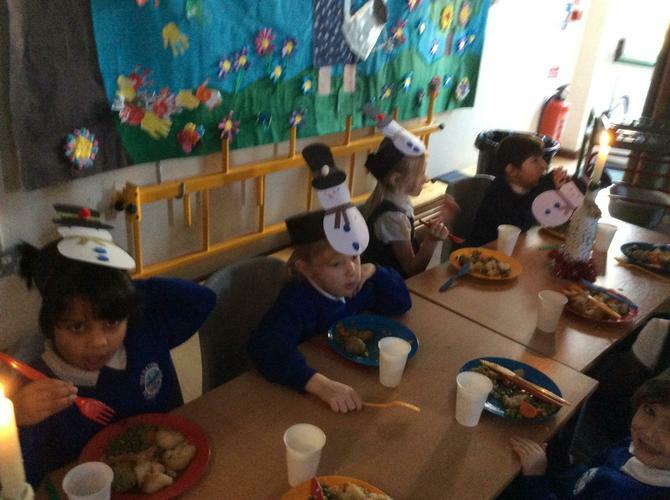 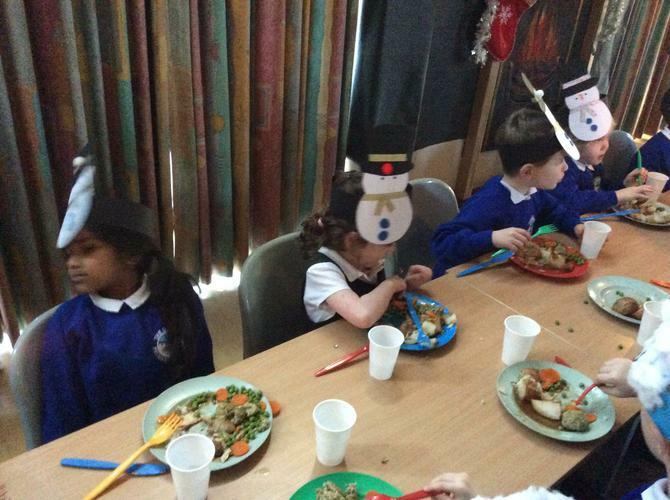 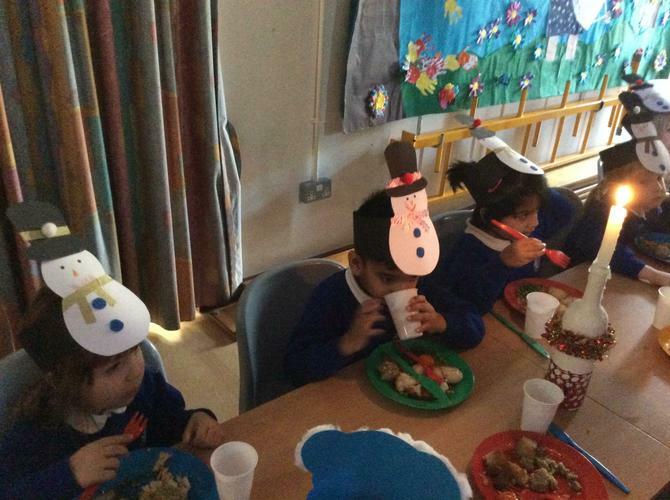 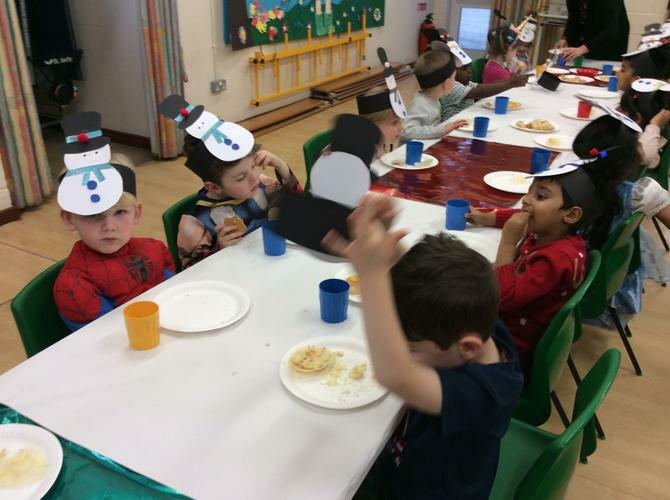 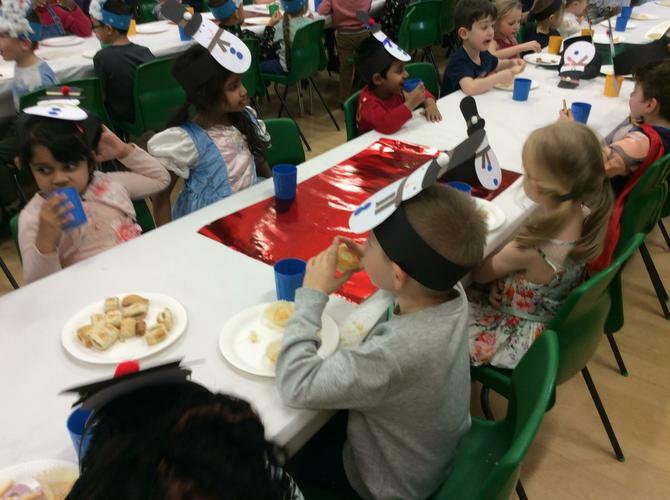 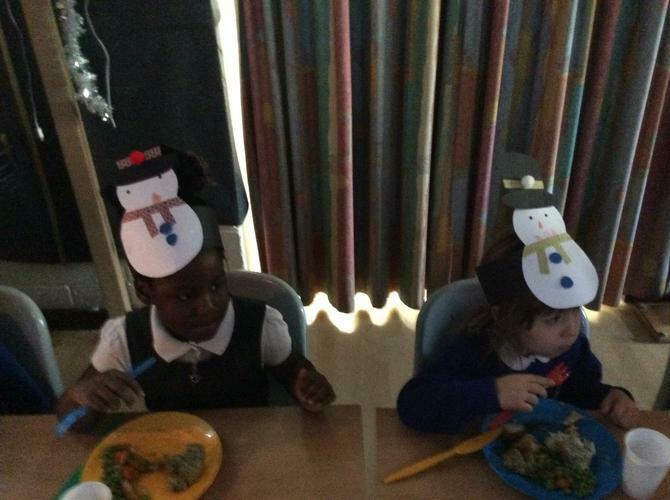 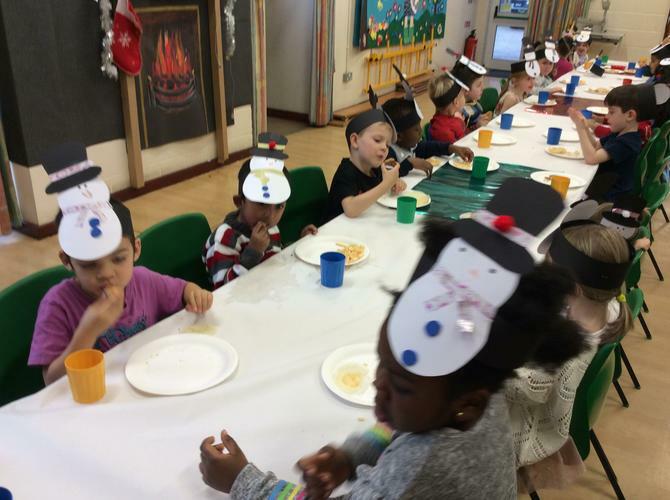 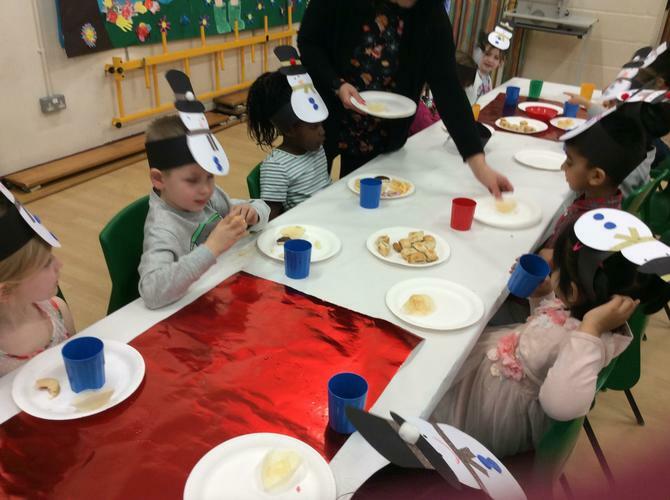 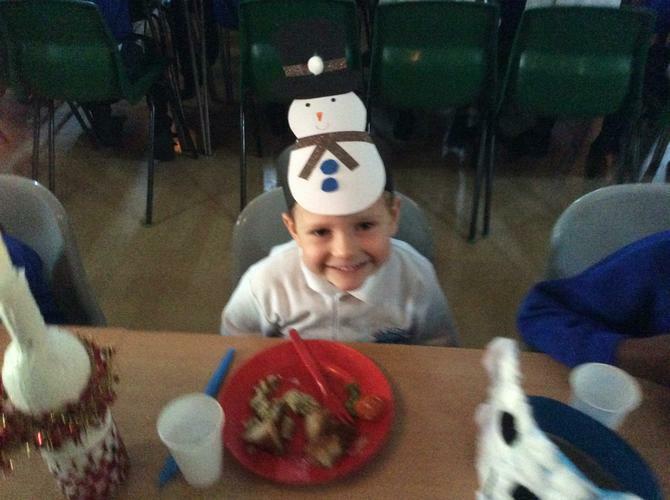 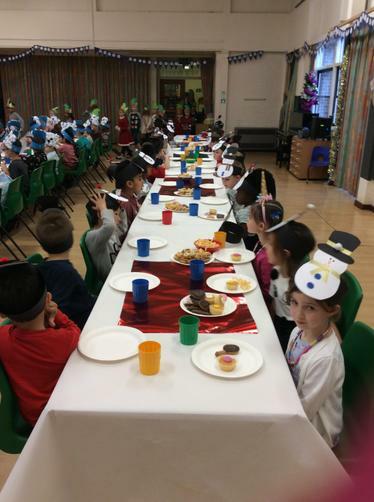 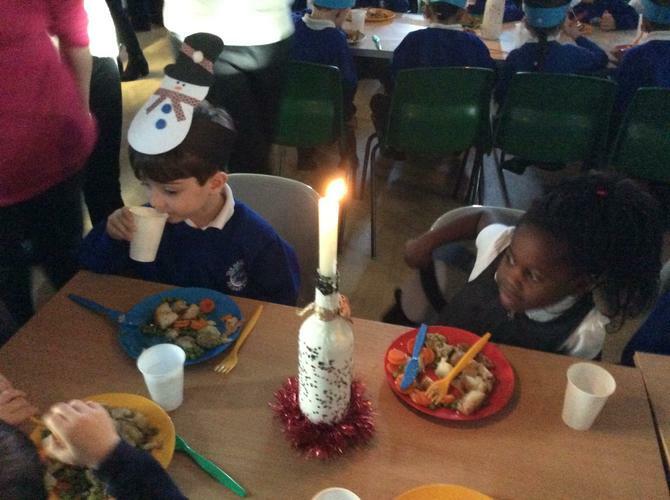 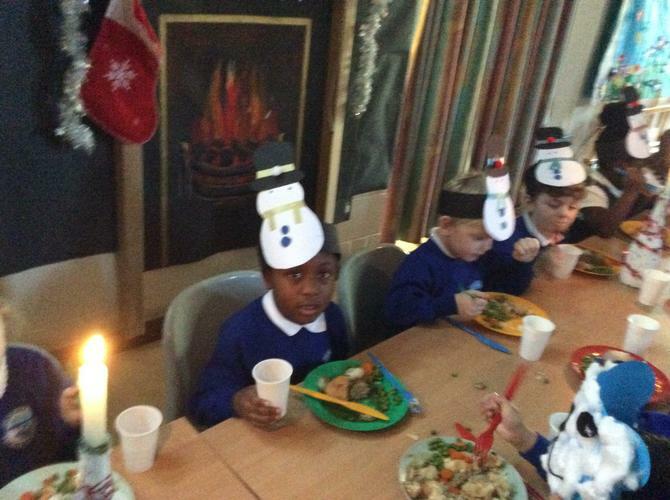 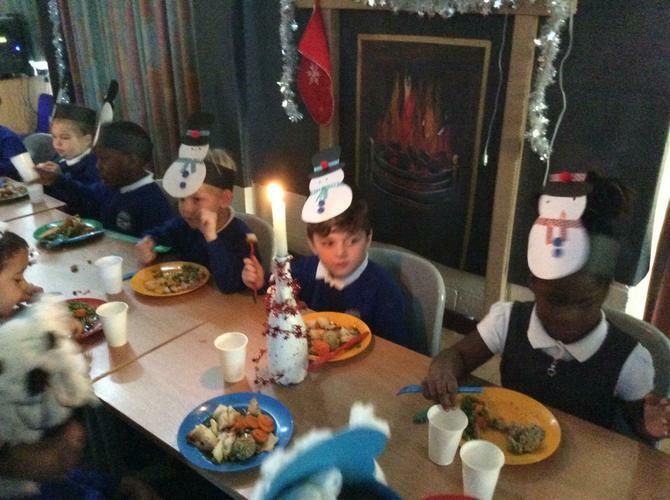 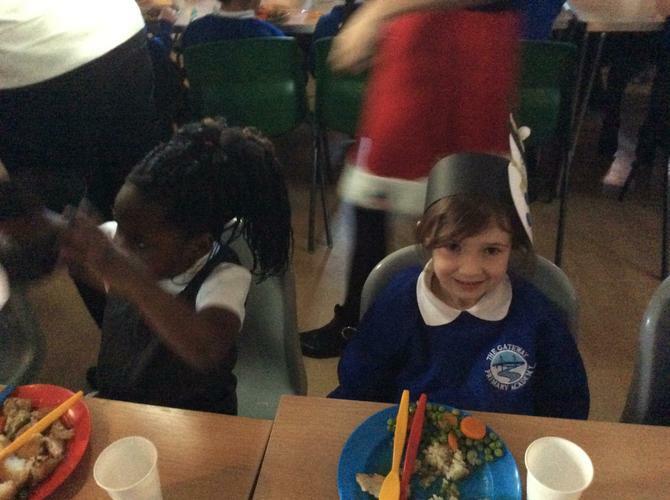 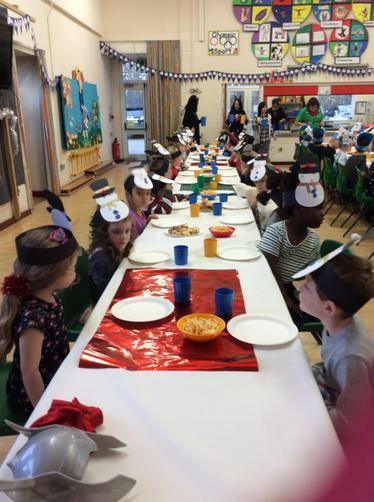 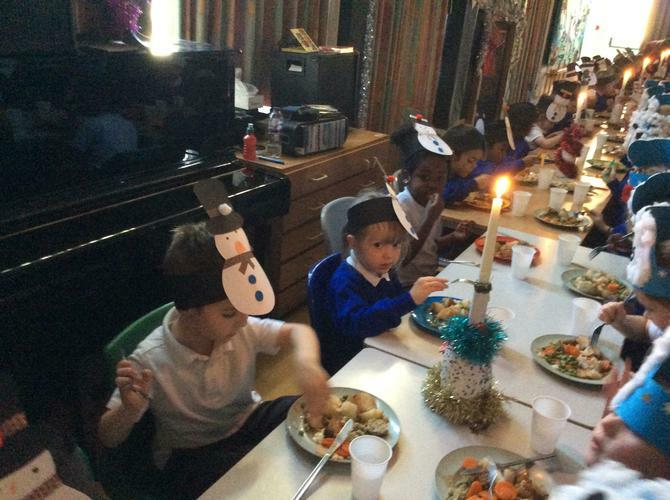 We made our Christmas hats that we wore for our Christmas dinner and had a great time at our Christmas party. 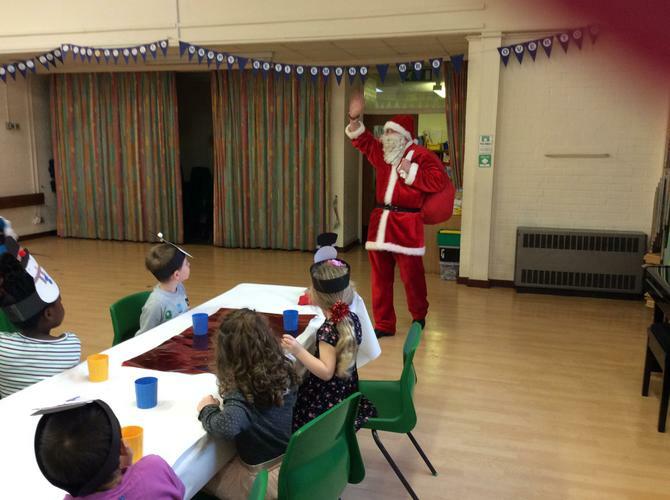 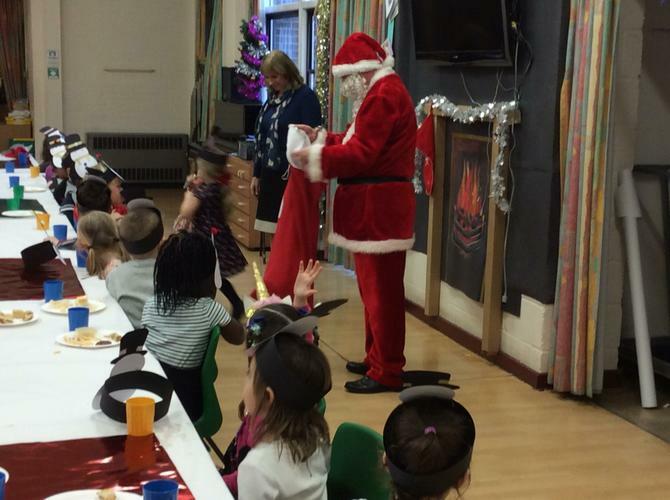 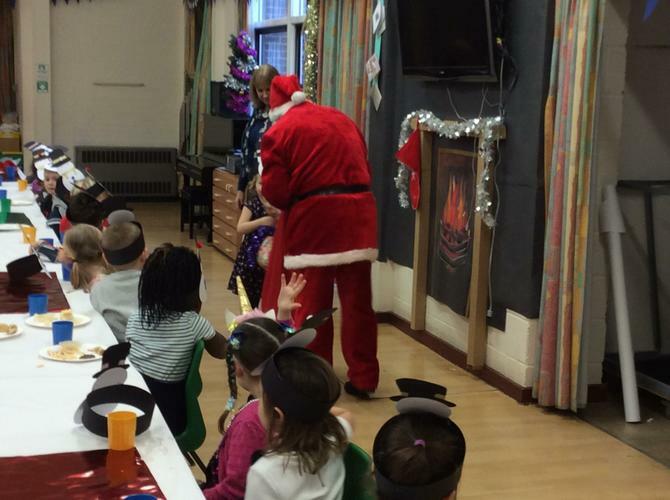 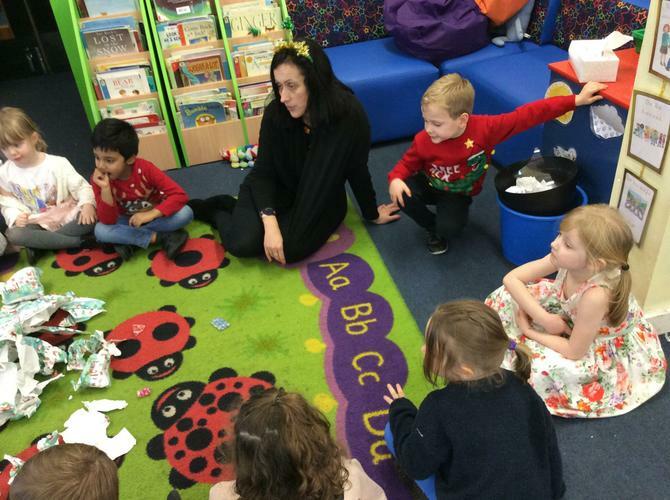 The children played pass the parcel and musical statues before we had food in the hall with a special guest! 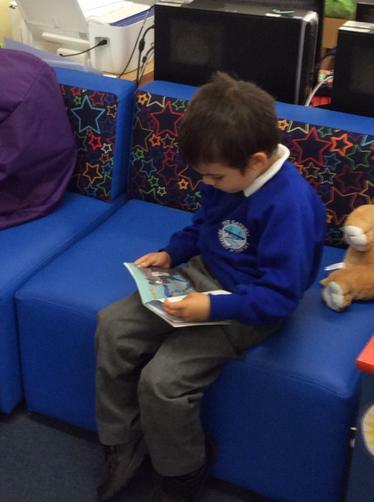 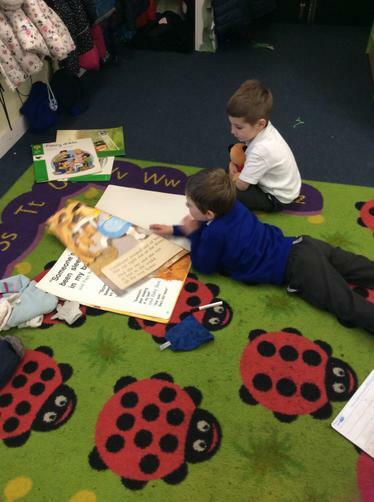 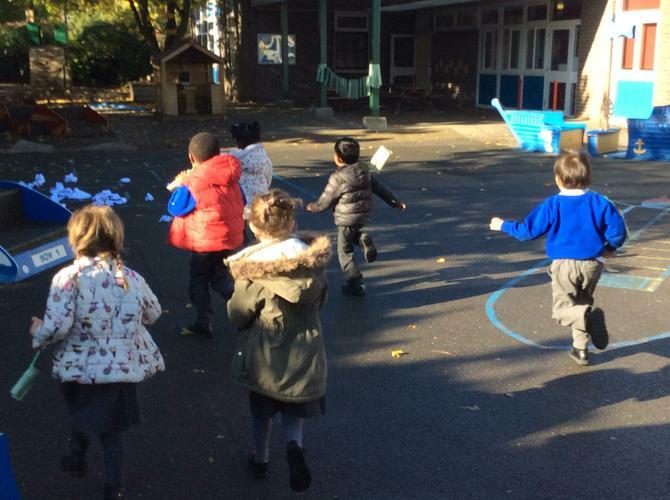 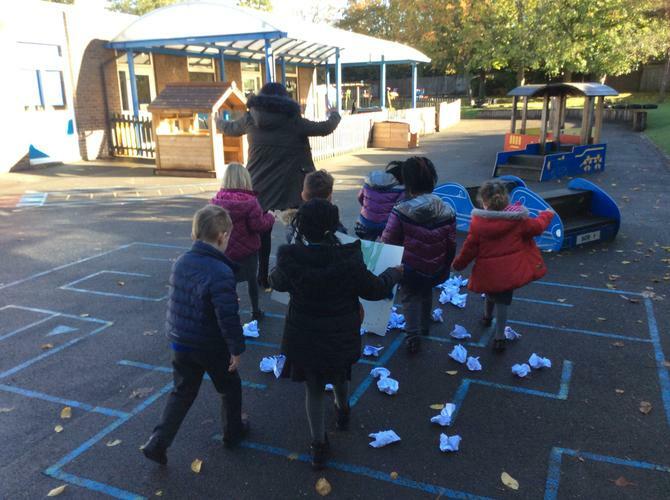 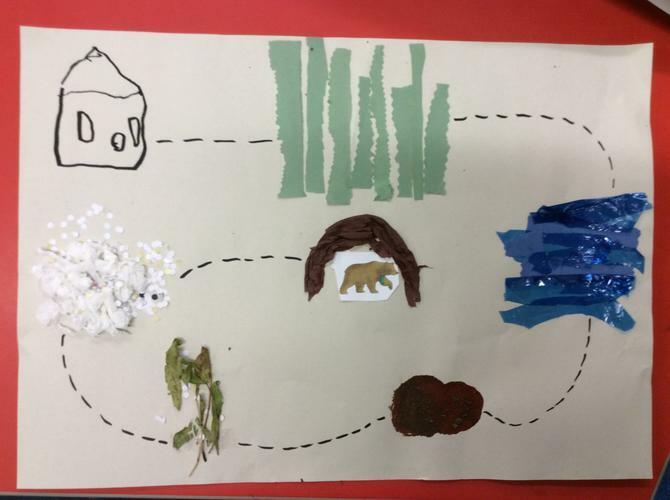 As part of our new ‘Transport and Journeys’ topic, we have been reading the book ‘We’re going on a bear hunt’. 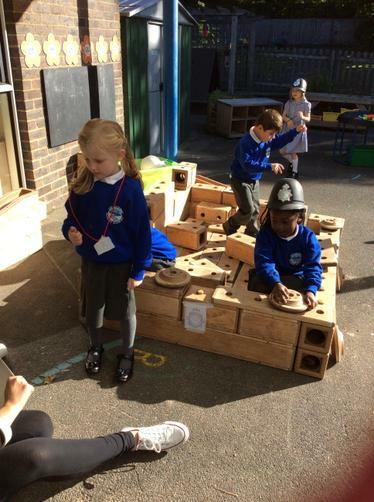 All week we have been acting out the story, making bear caves, as well as making maps and binoculars to spot any bears at school. 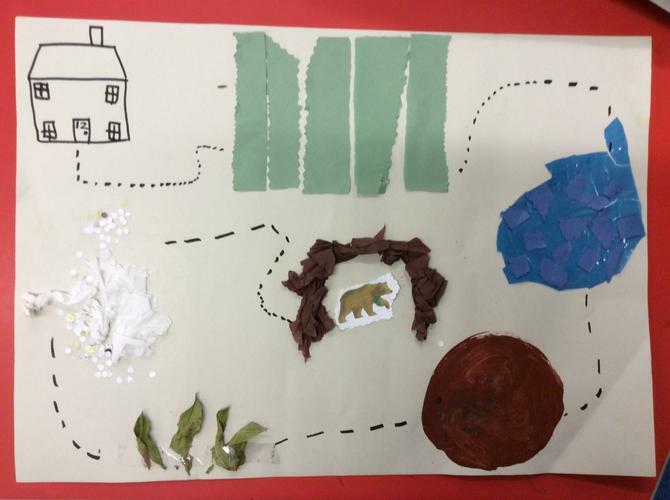 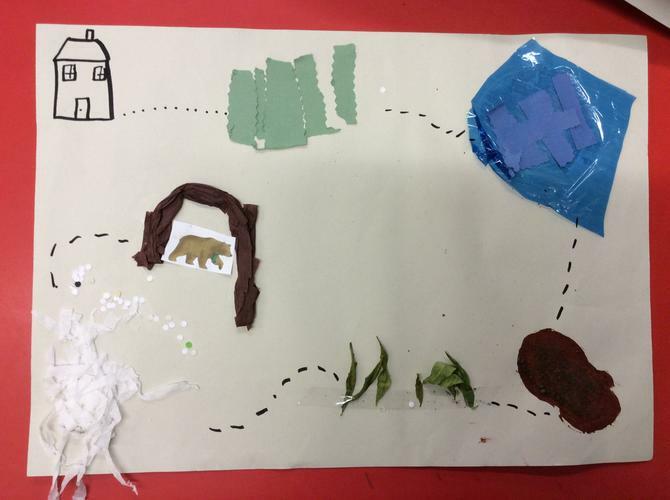 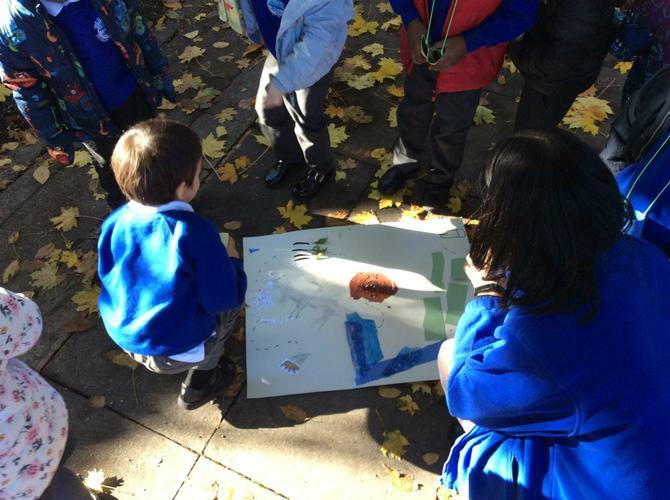 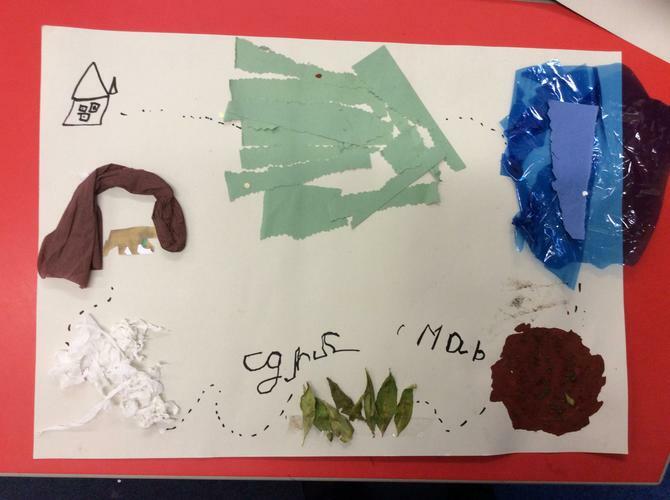 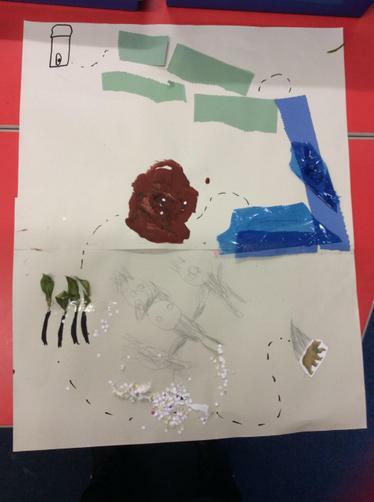 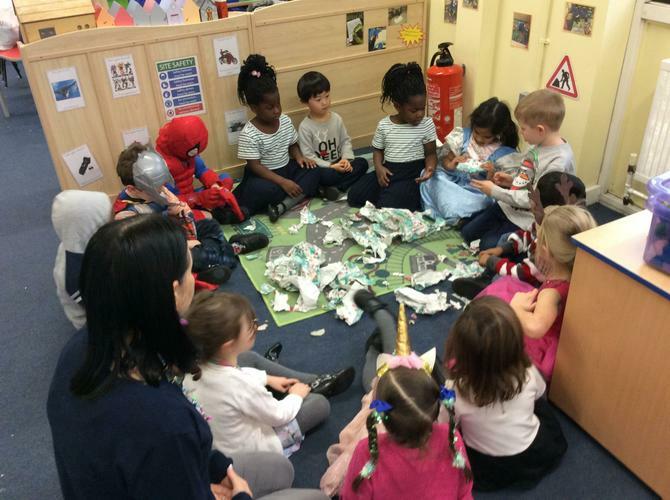 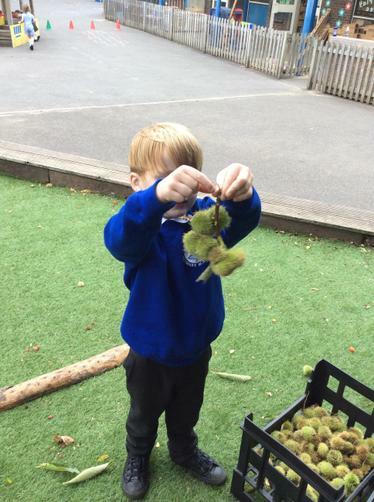 As a result of making our maps we went on a bear hunt of our own and found a bear’s cave with a sleepy bear inside! 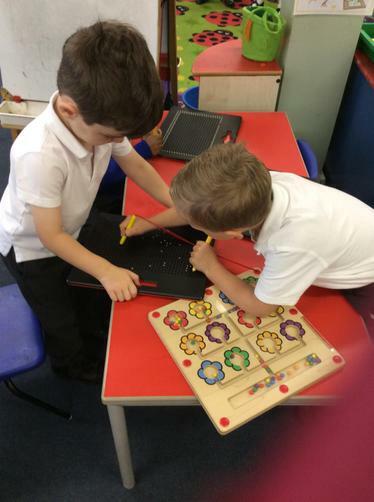 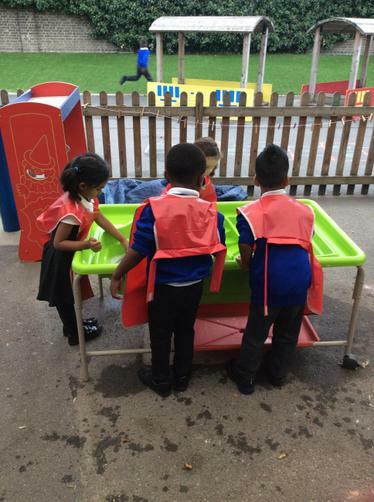 We've been working hard, making new friends and having fun! 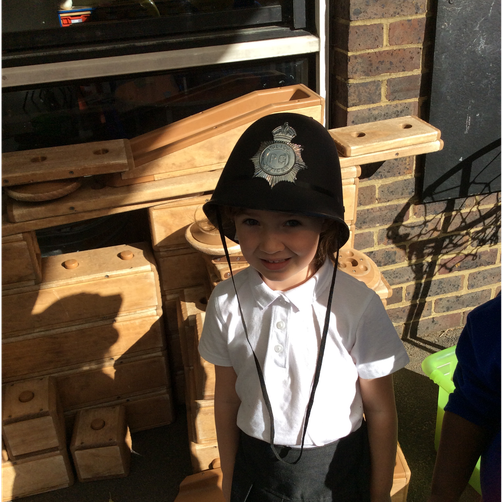 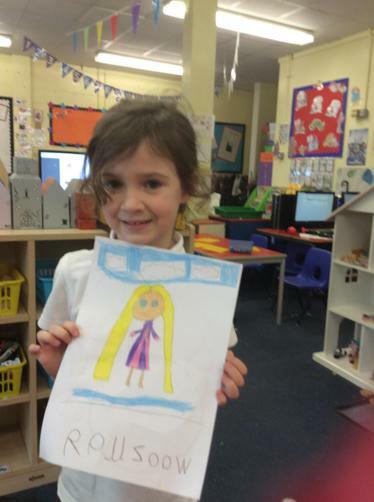 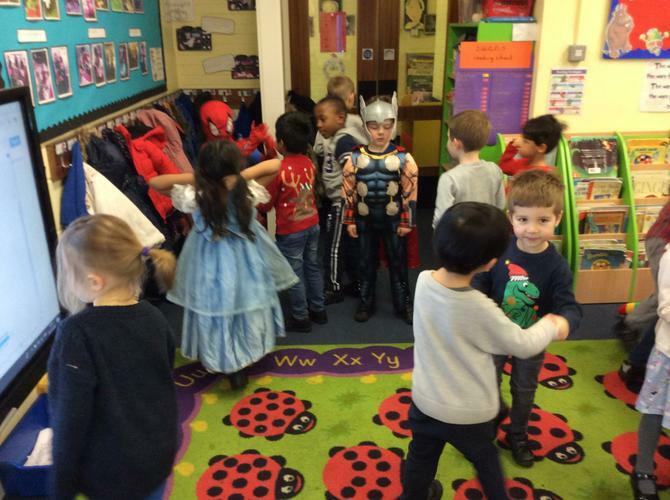 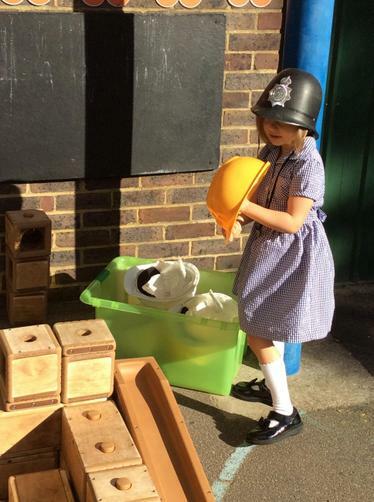 Our topic has been 'Ourselves and our community' and we have been learning about Doctors and Police. 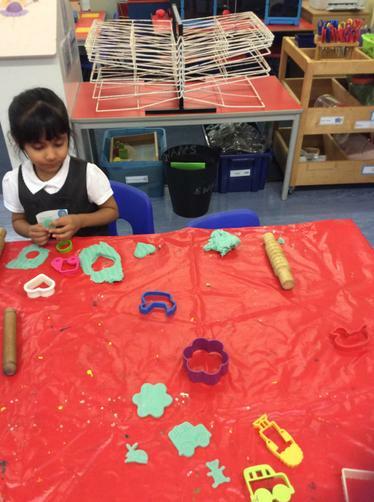 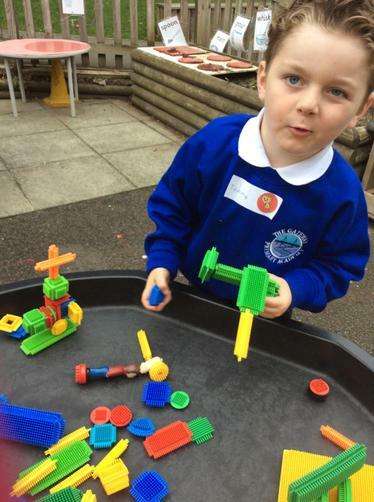 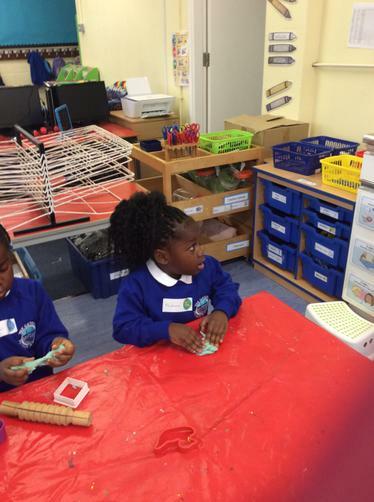 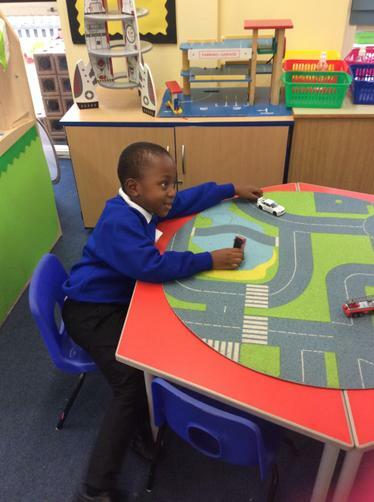 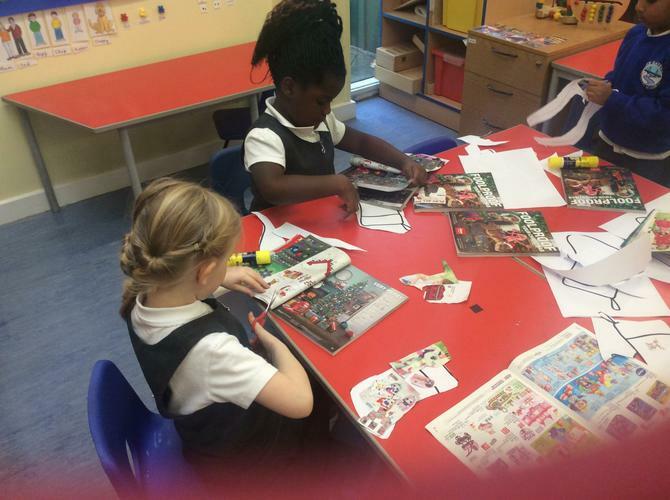 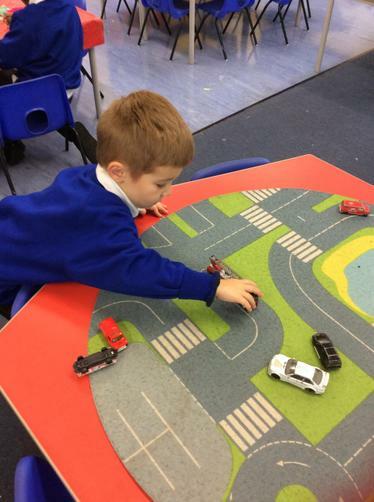 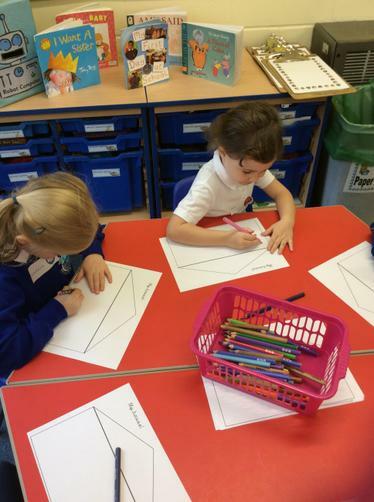 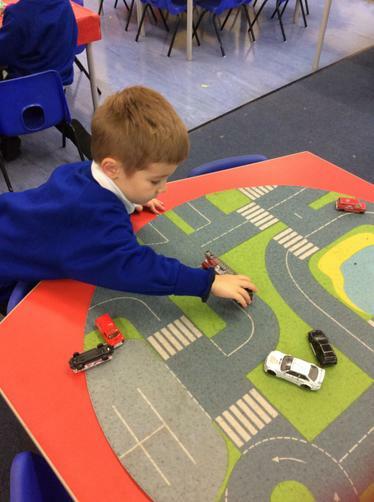 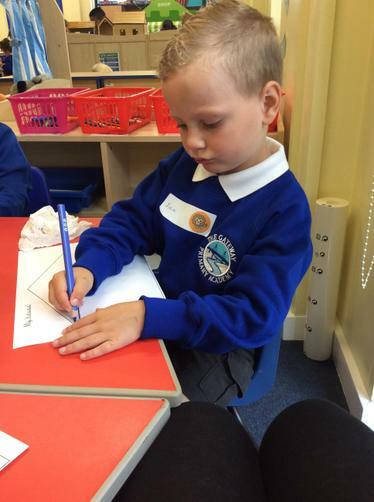 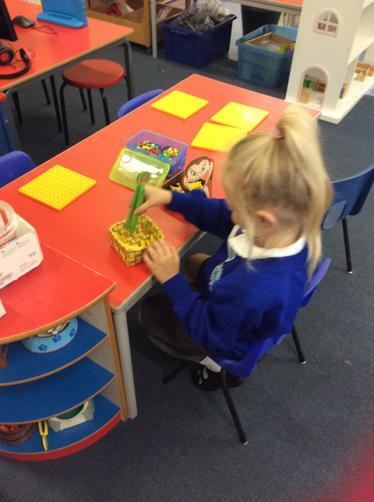 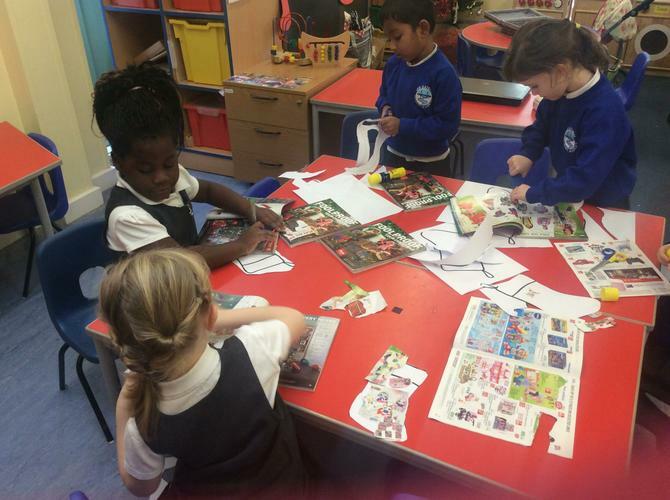 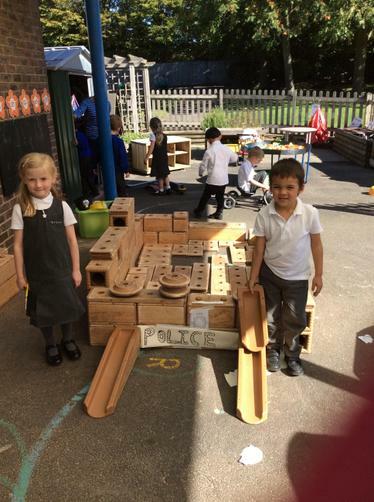 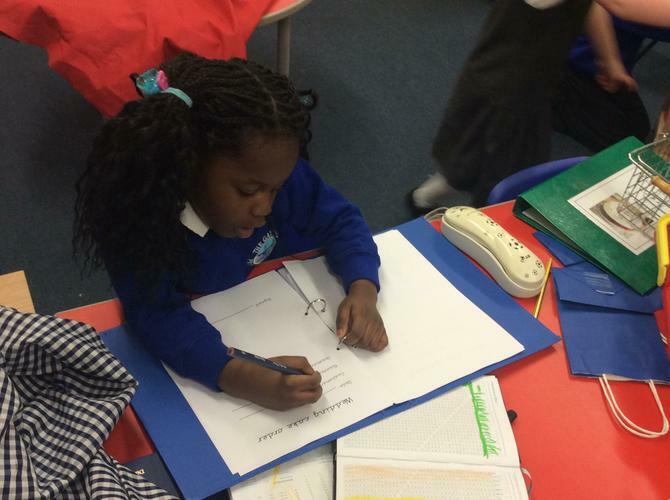 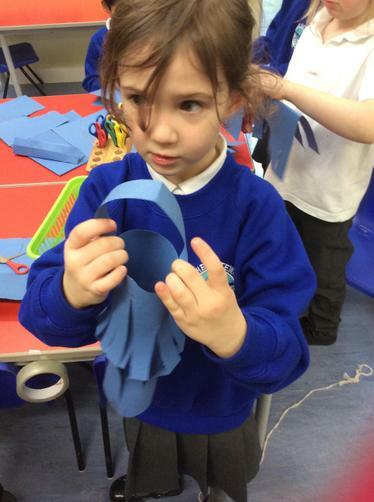 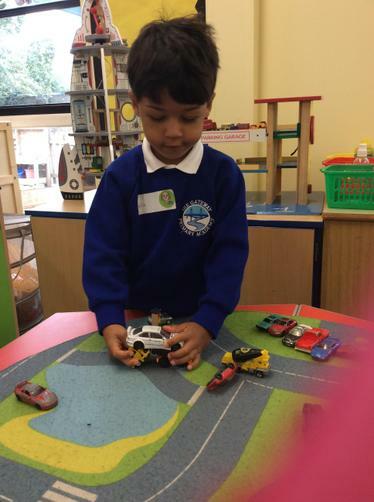 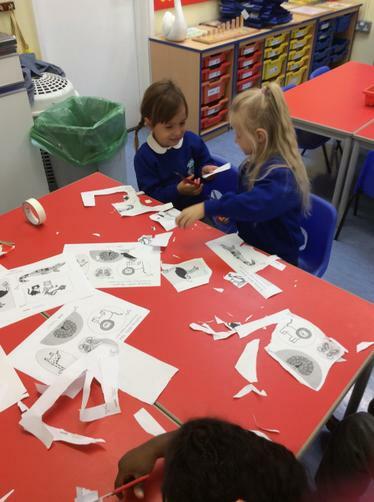 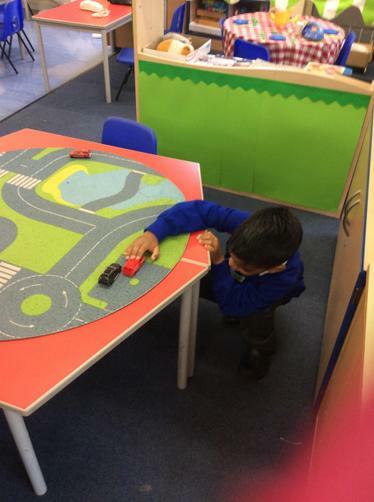 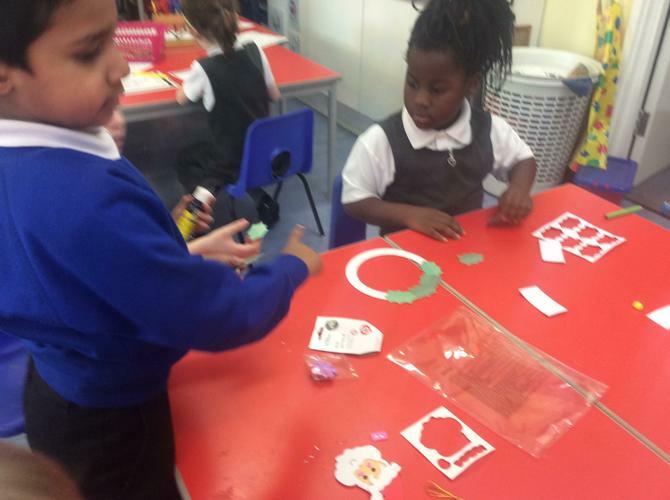 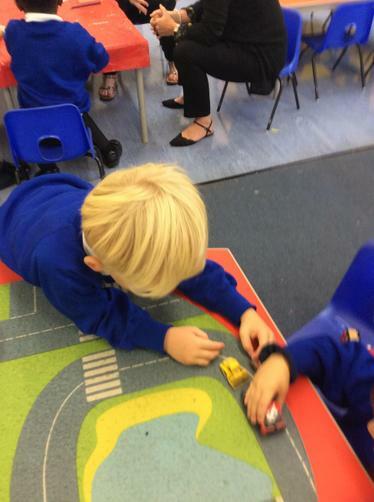 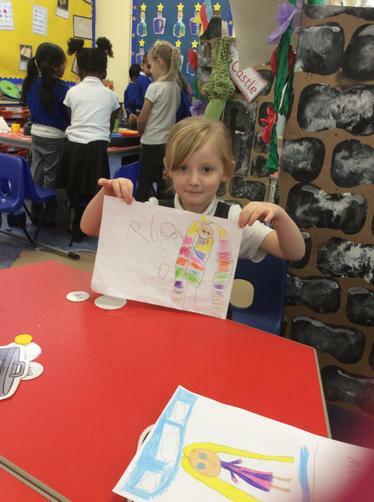 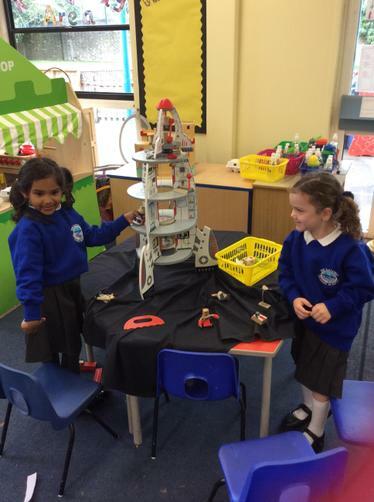 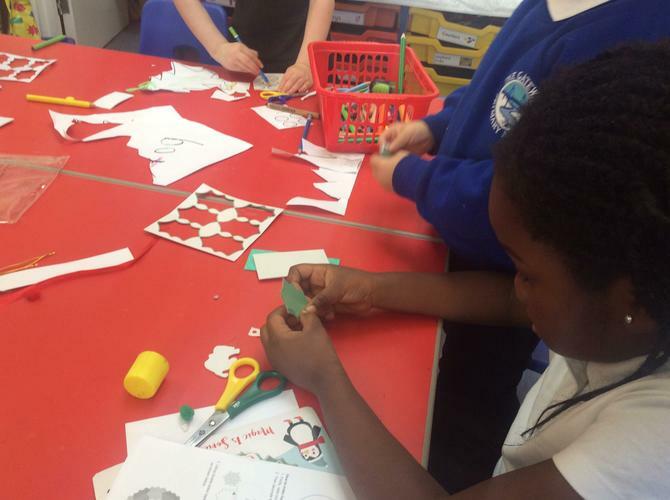 We have been building police cars, writing our own Doctor name labels and much more. 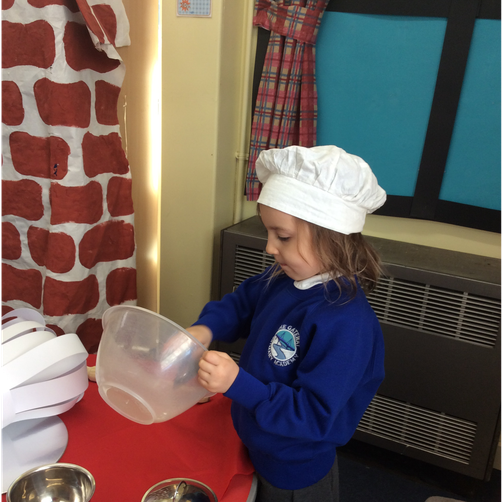 We have been busy, busy, busy! 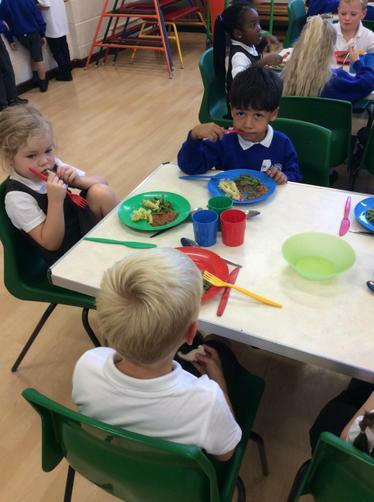 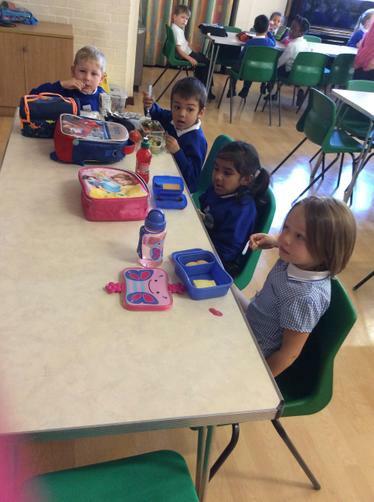 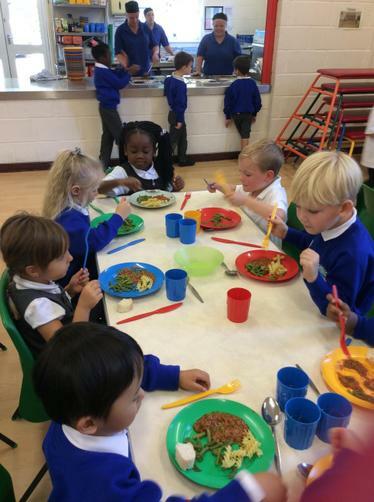 Our first lunch at school. 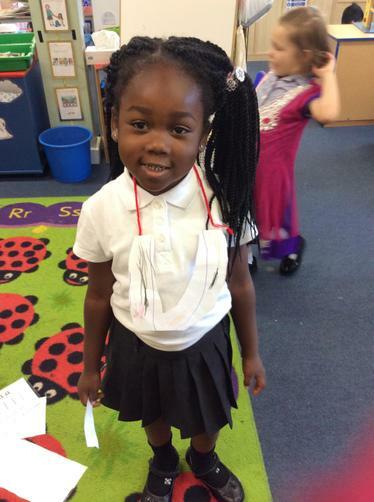 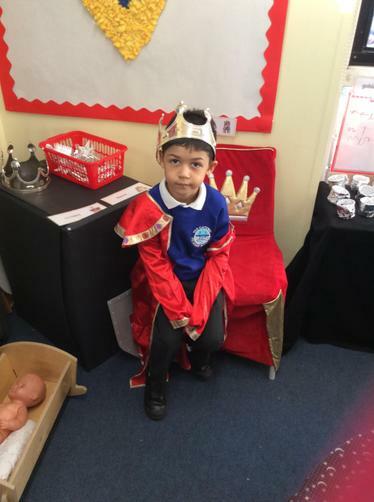 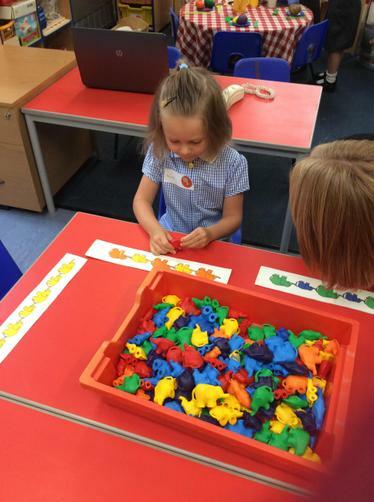 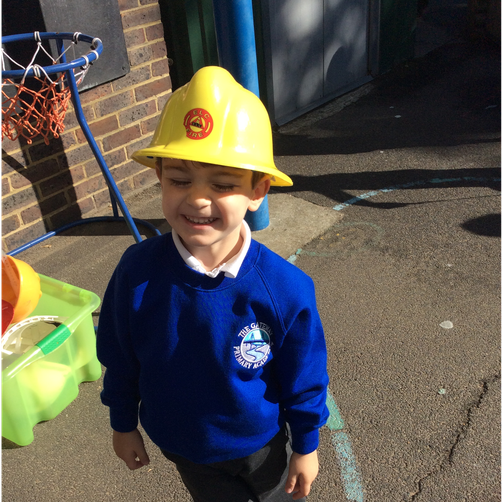 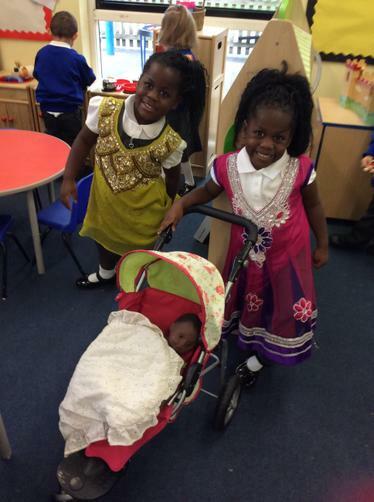 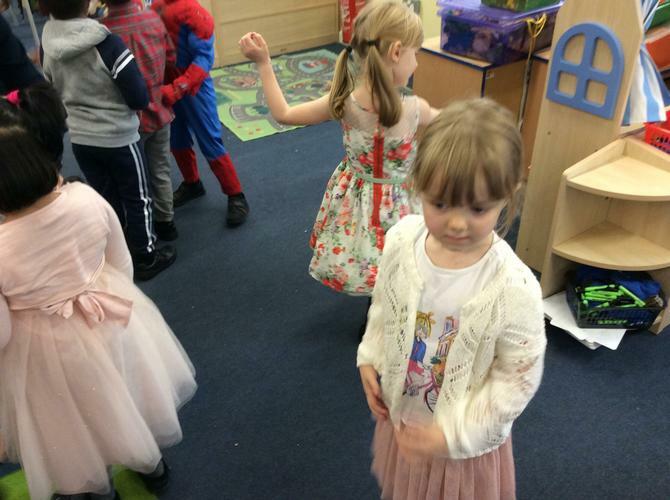 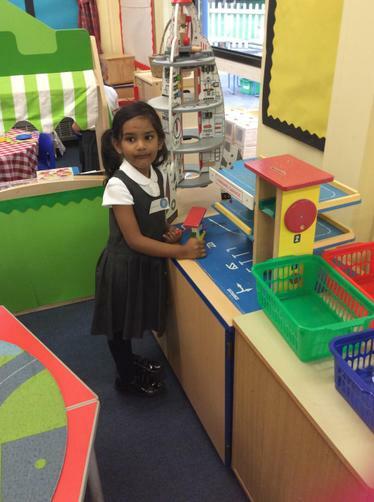 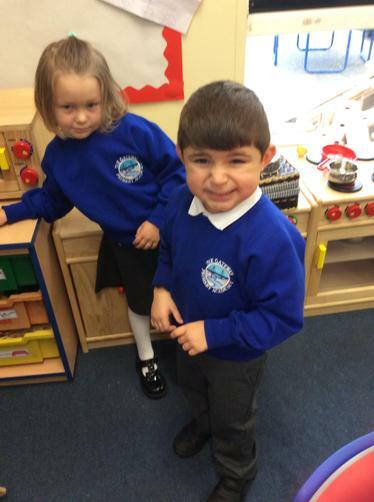 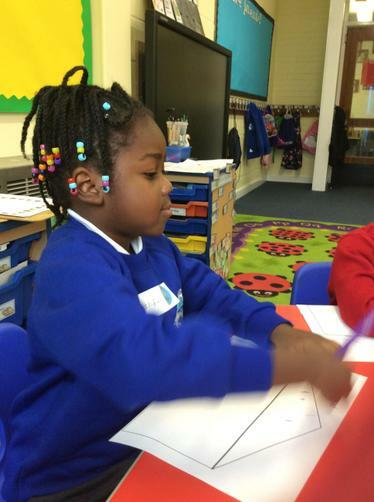 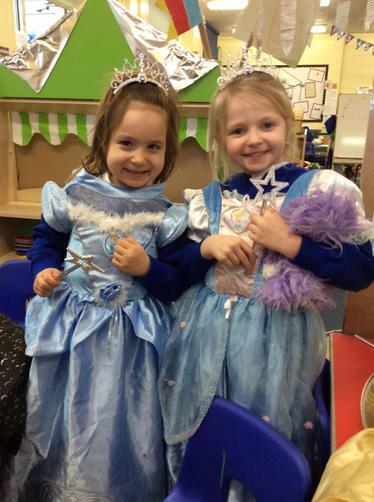 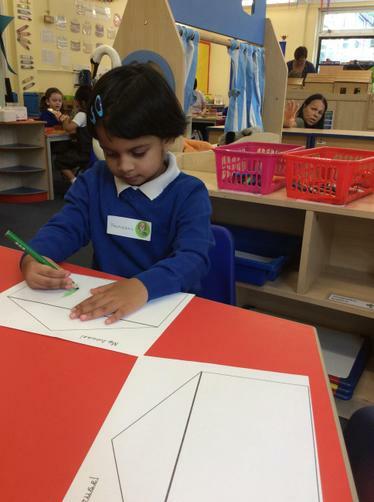 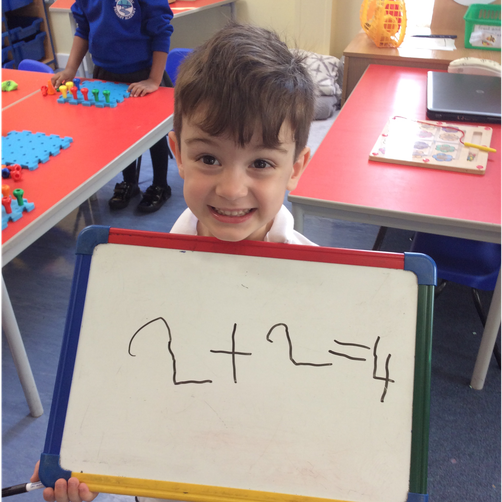 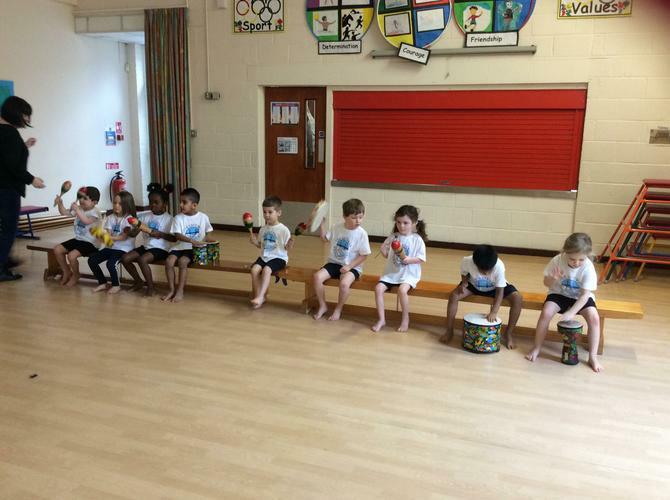 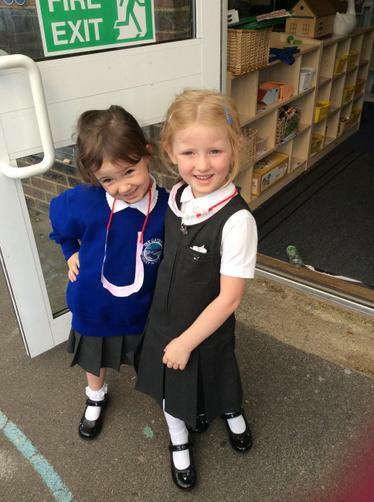 The children really enjoyed their first day at school and so did we! 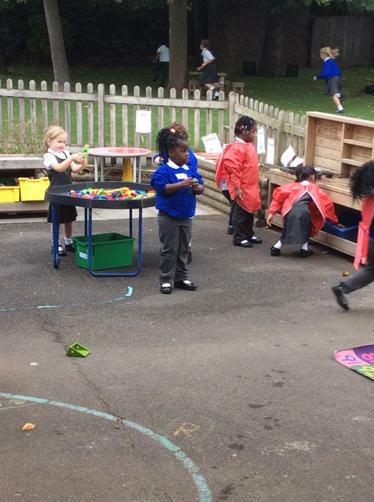 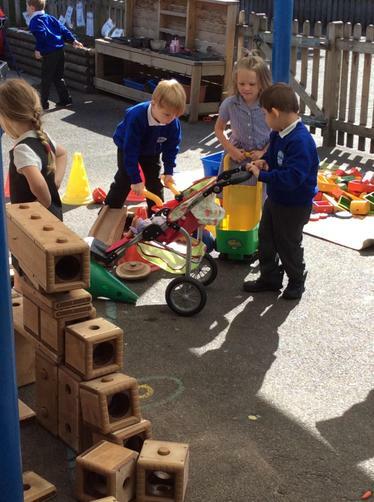 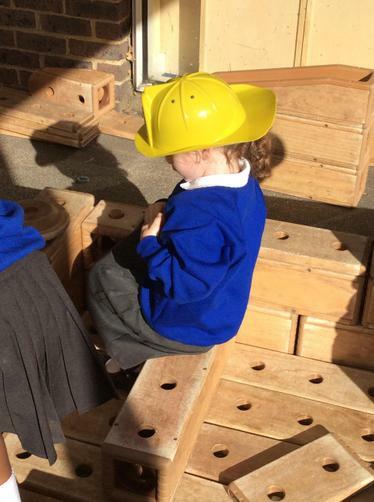 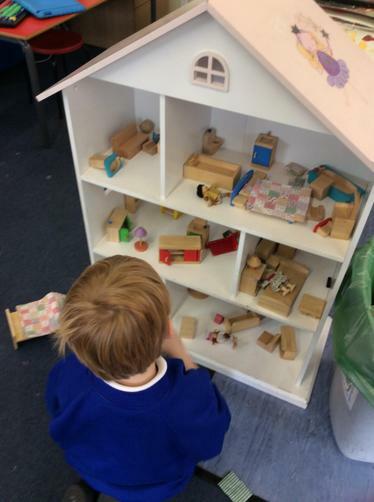 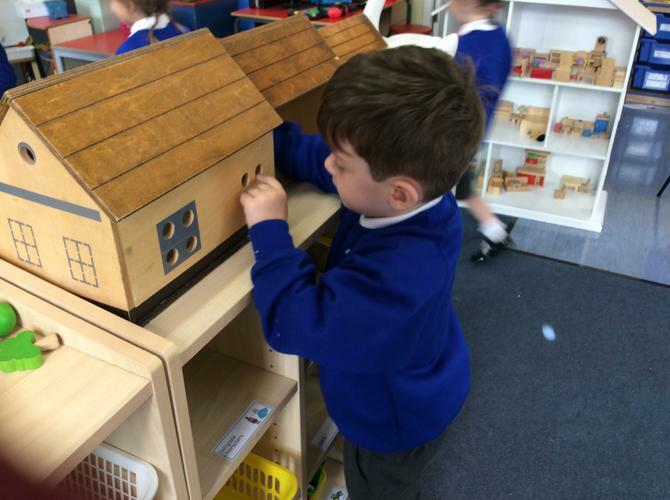 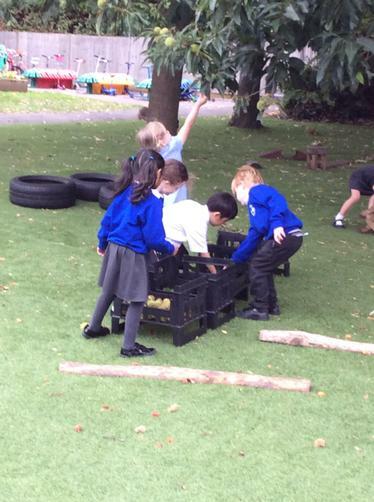 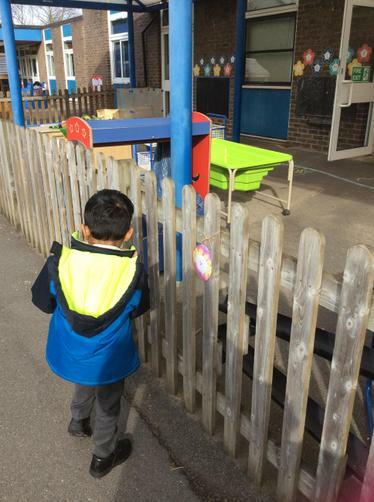 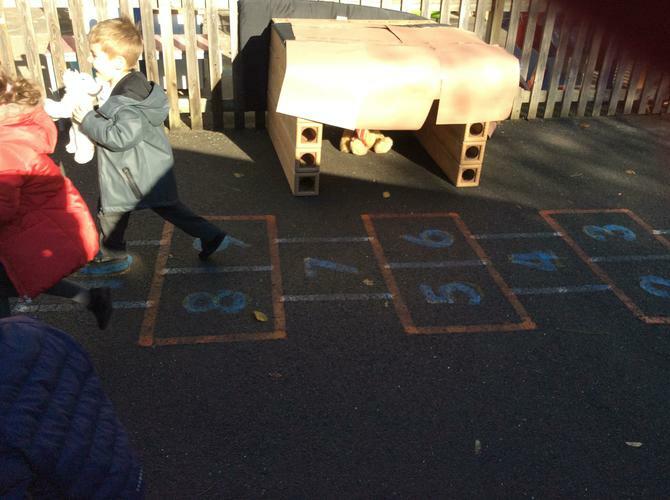 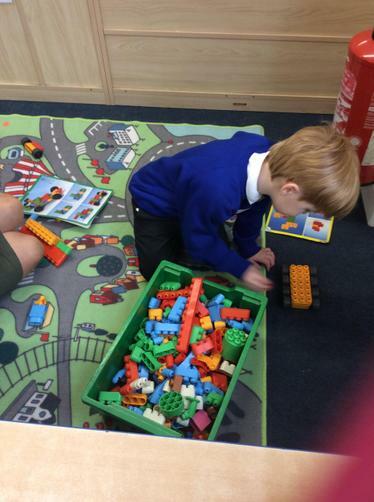 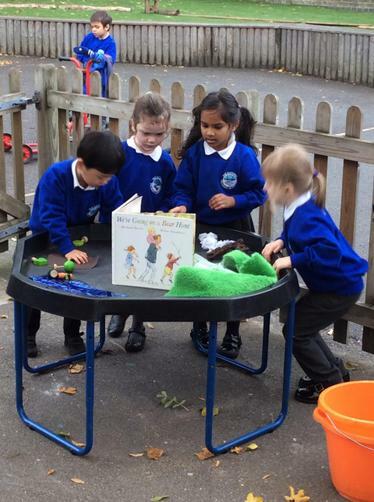 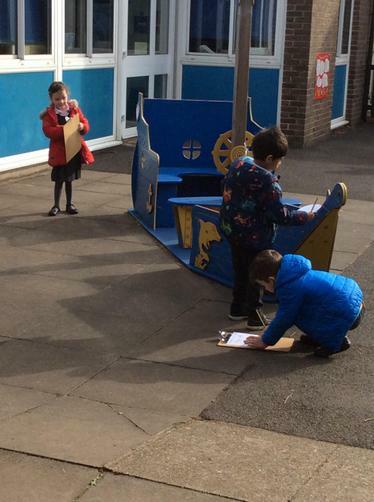 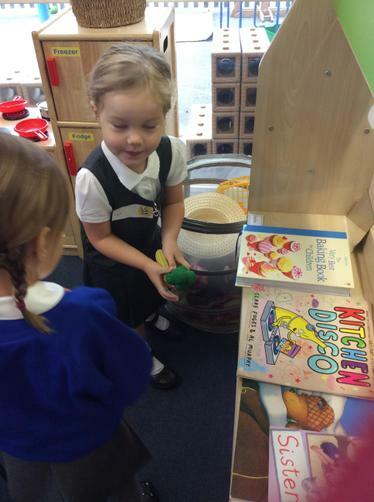 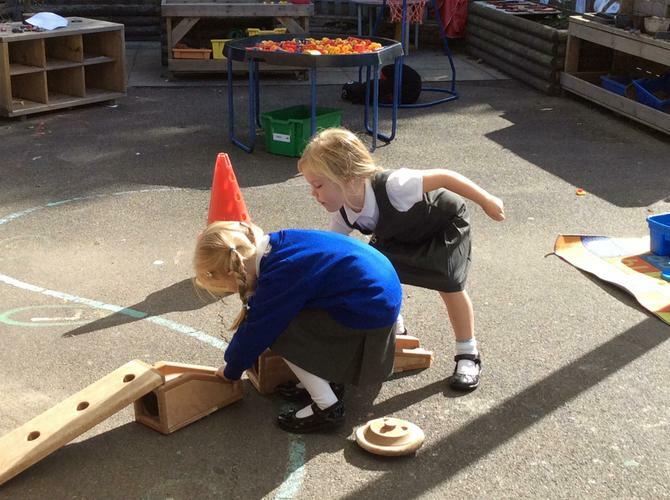 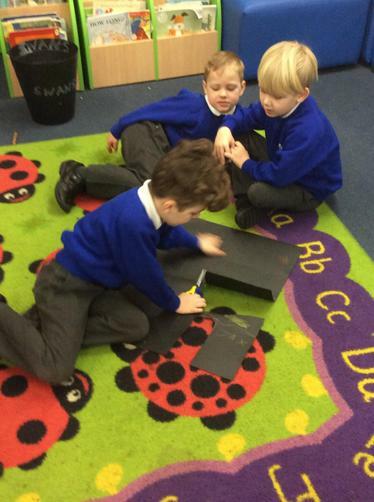 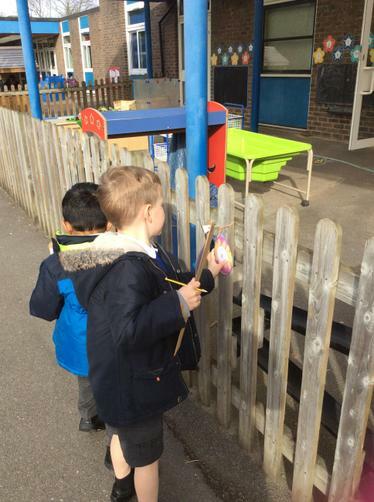 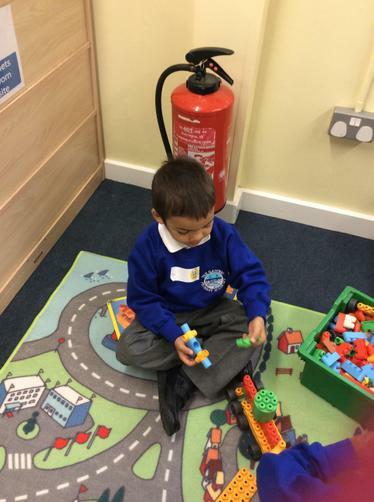 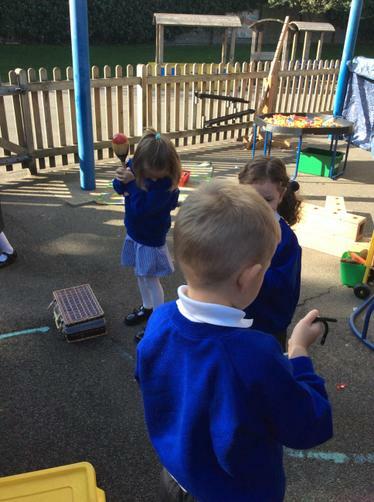 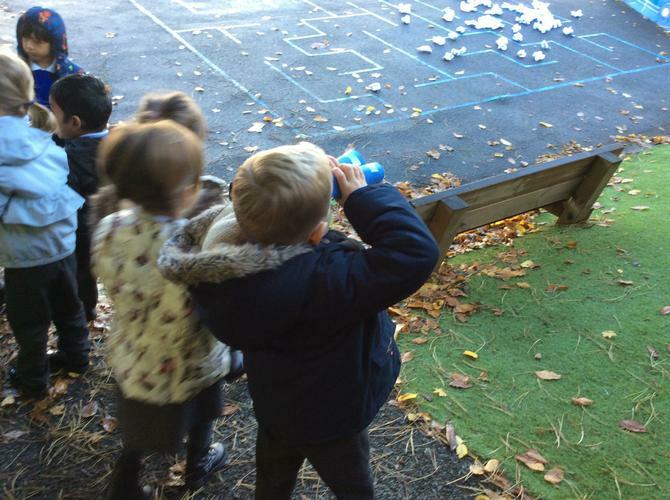 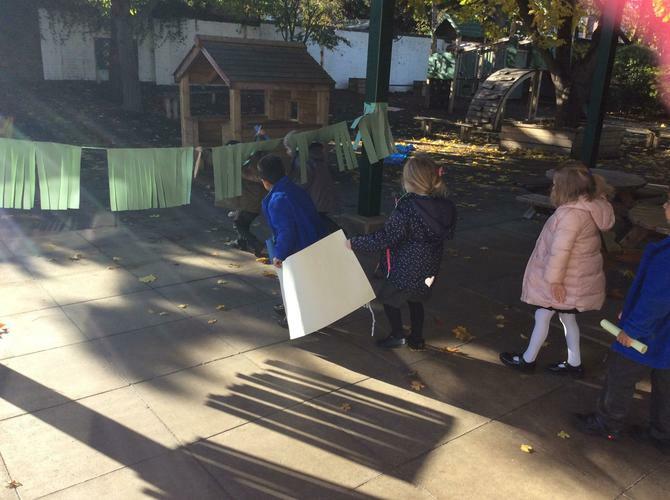 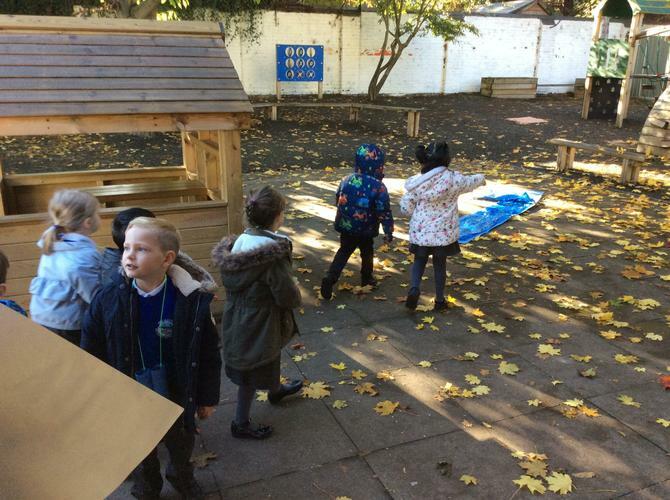 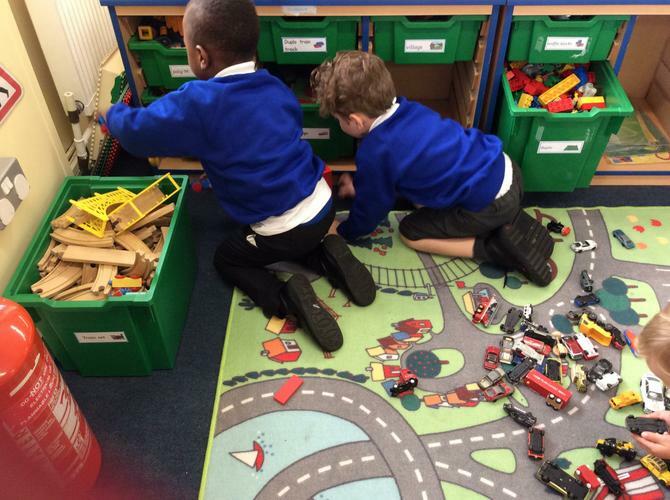 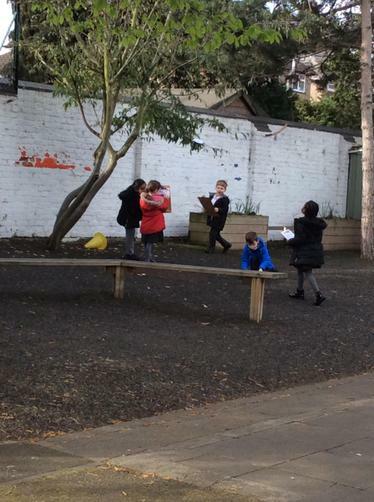 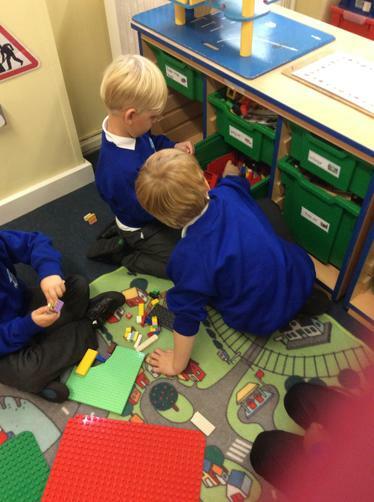 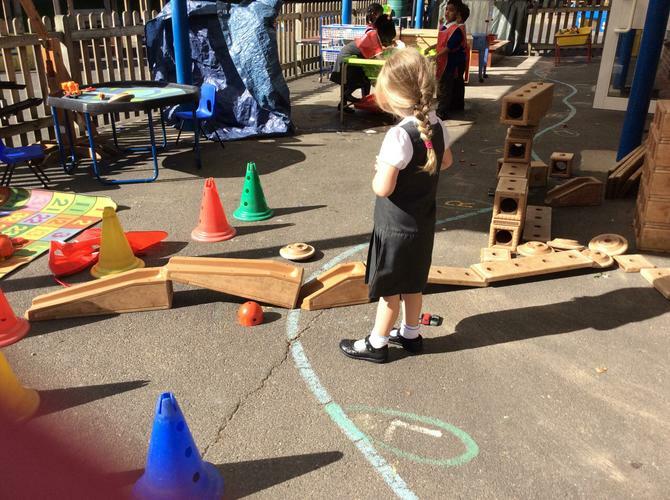 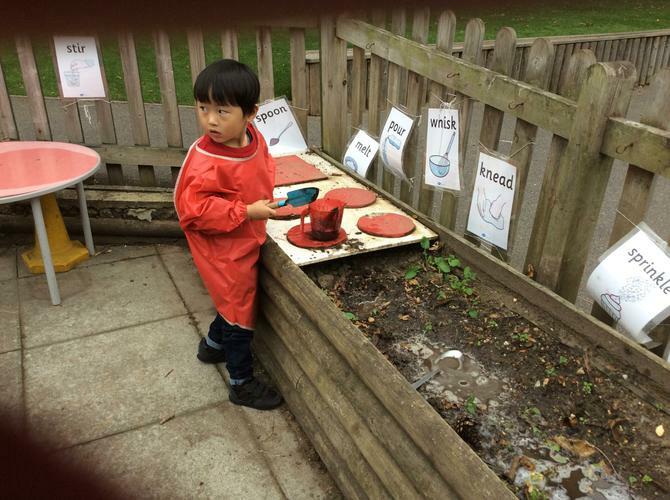 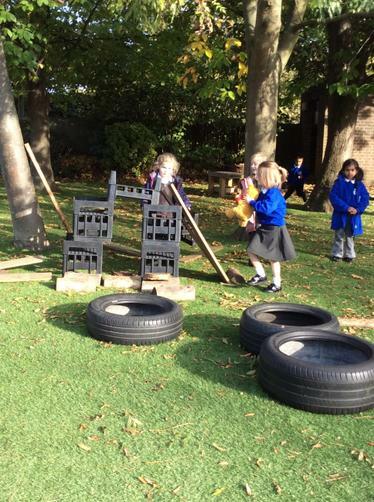 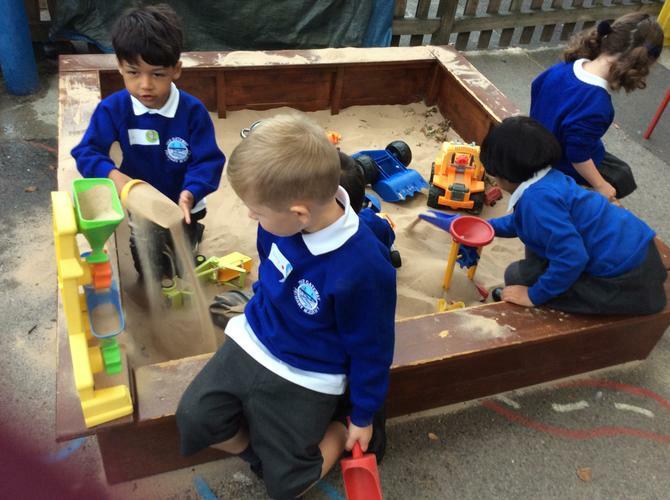 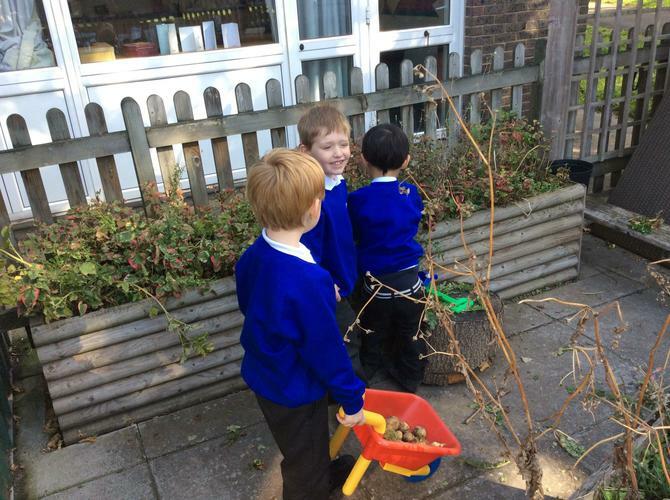 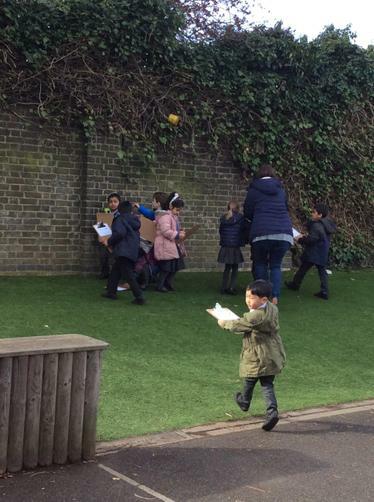 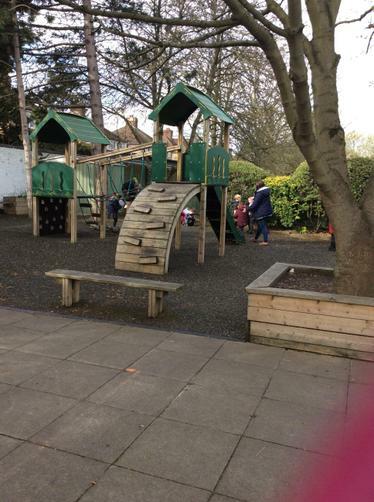 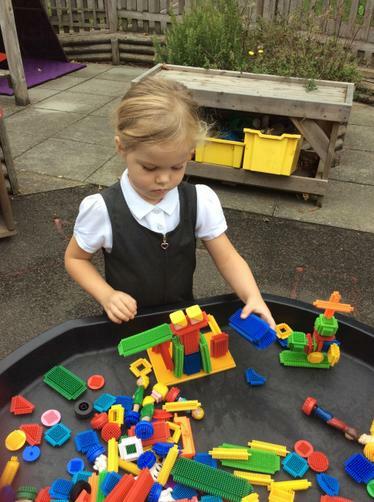 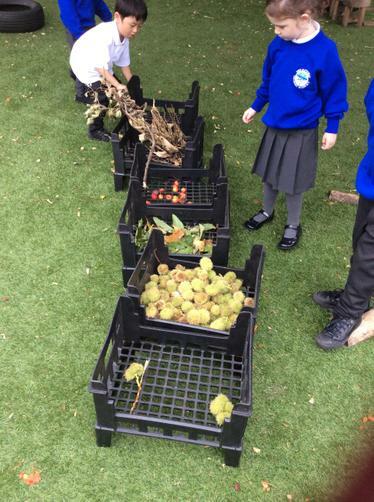 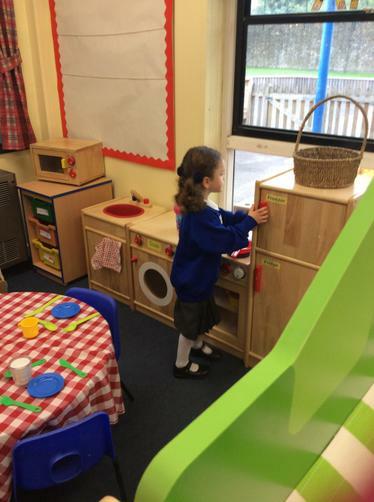 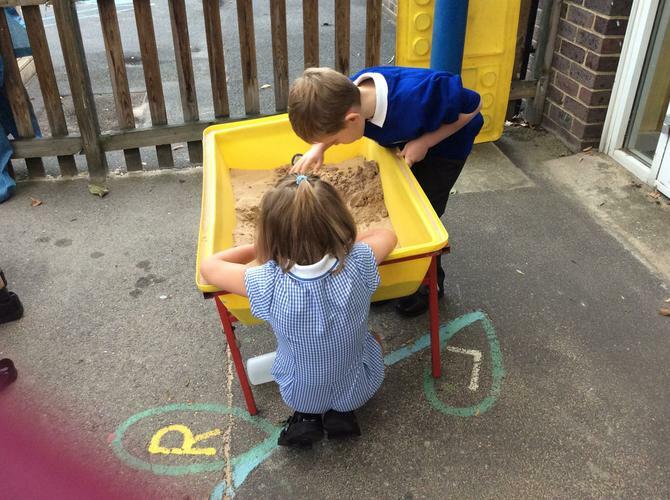 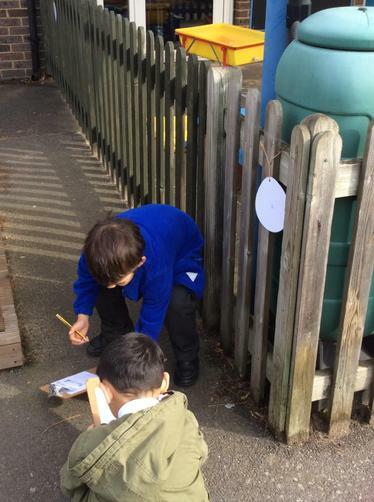 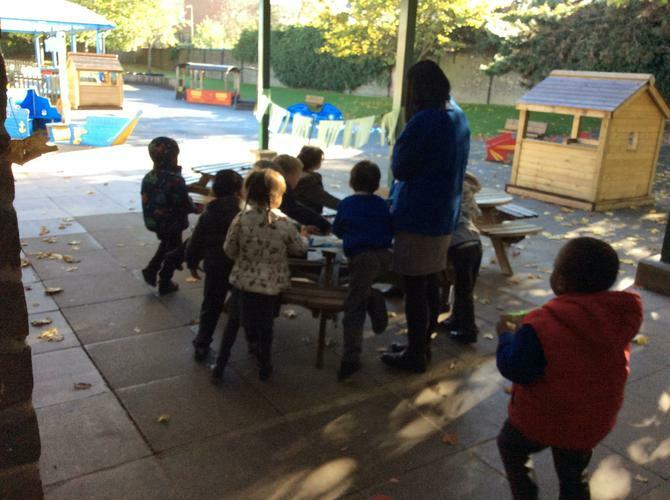 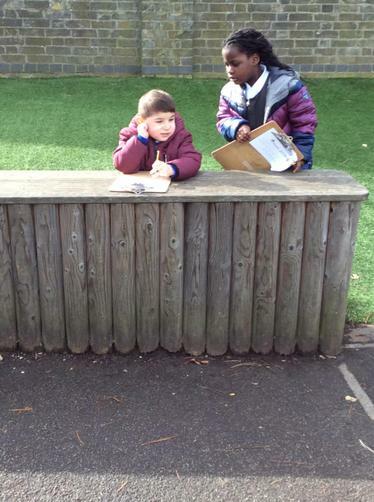 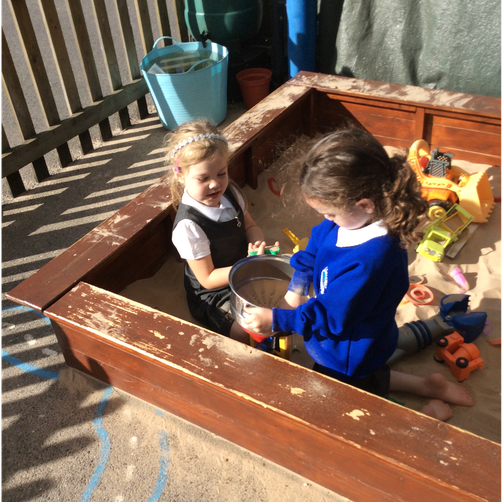 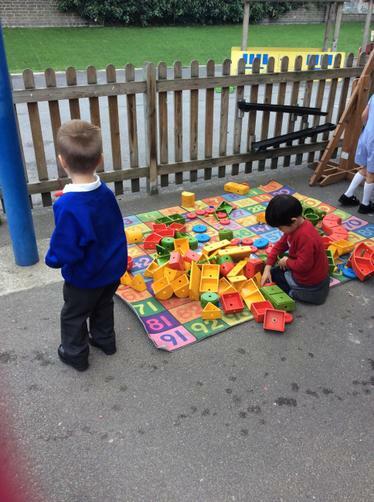 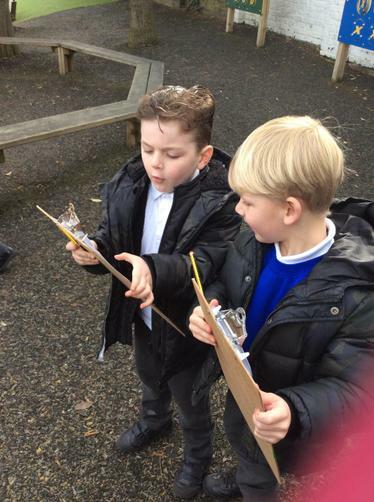 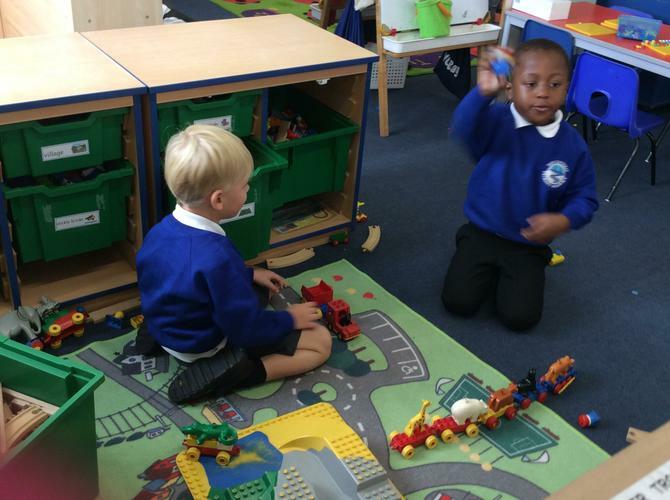 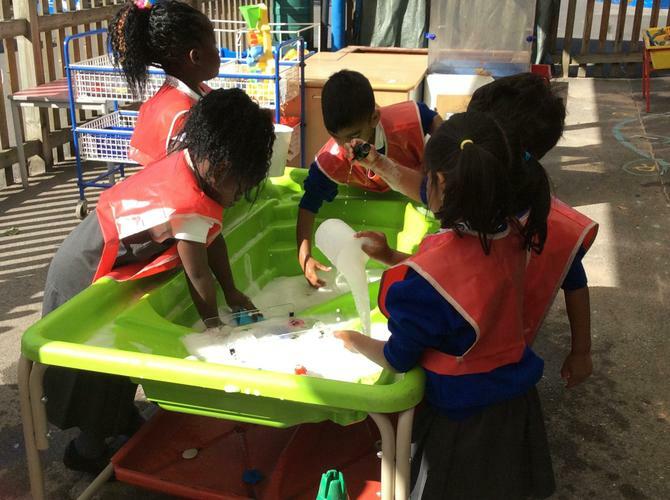 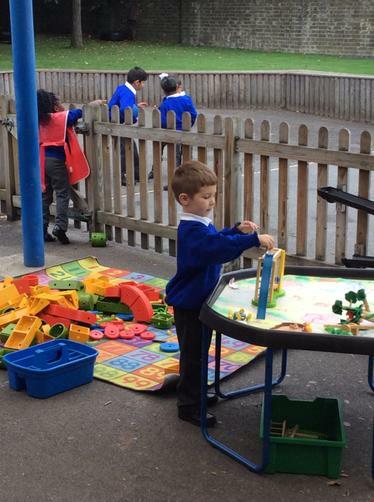 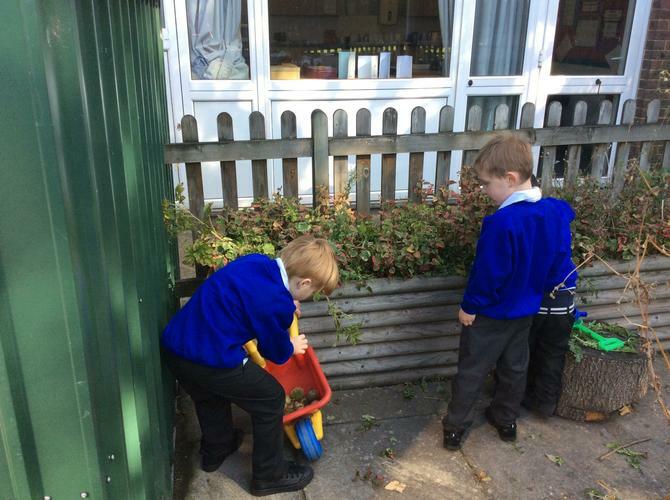 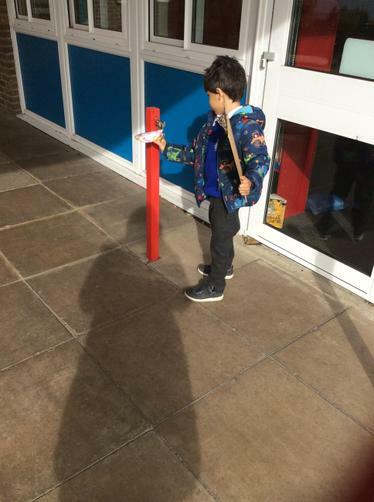 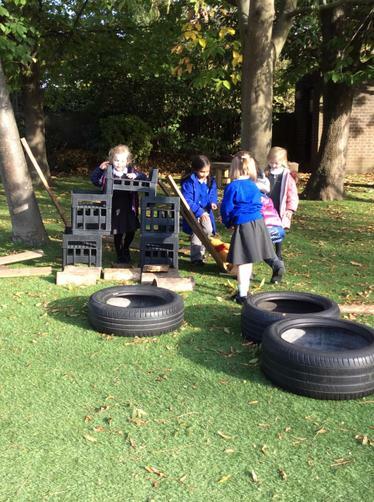 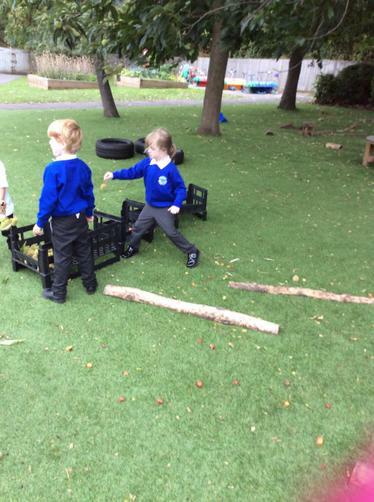 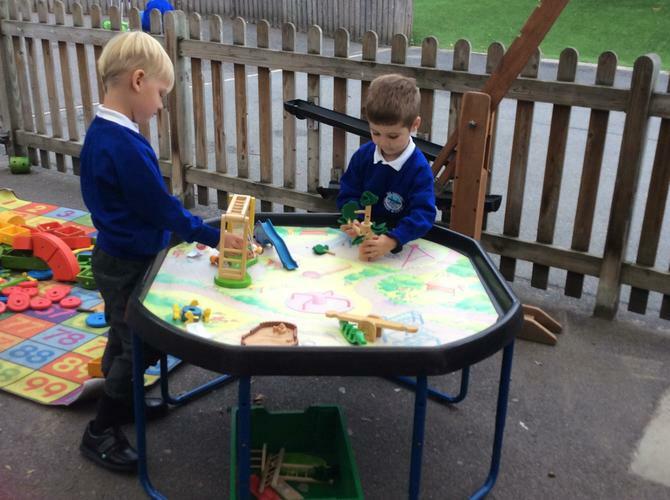 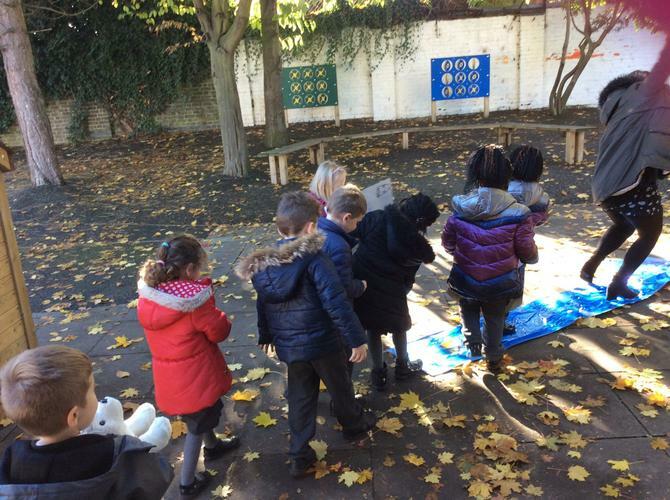 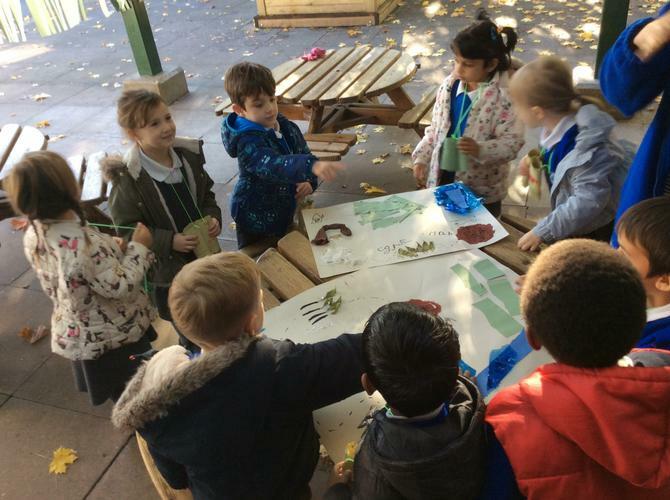 They loved exploring their new classroom and outdoor area, as well as making lots of new friends.